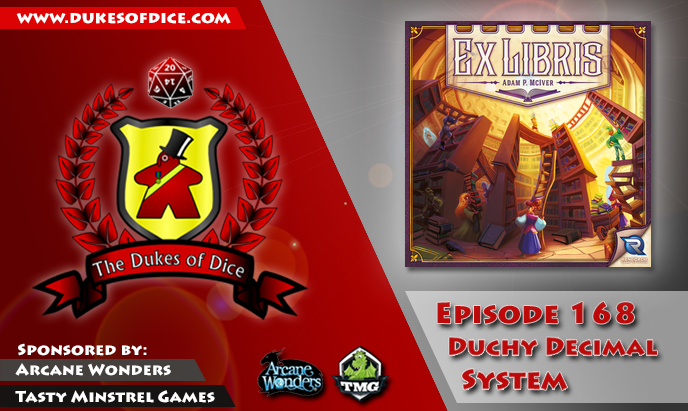 ... Look back at their review of Ex Libris in their Dukes' Double-Take (1:18:48). 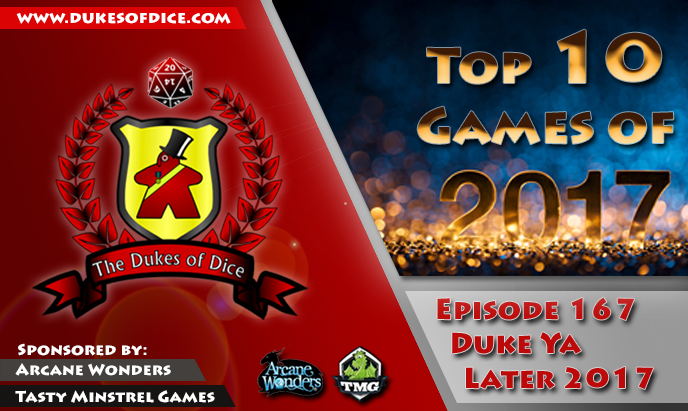 This episode the Dukes ring in the new year by giving you their top 10 games of 2018! 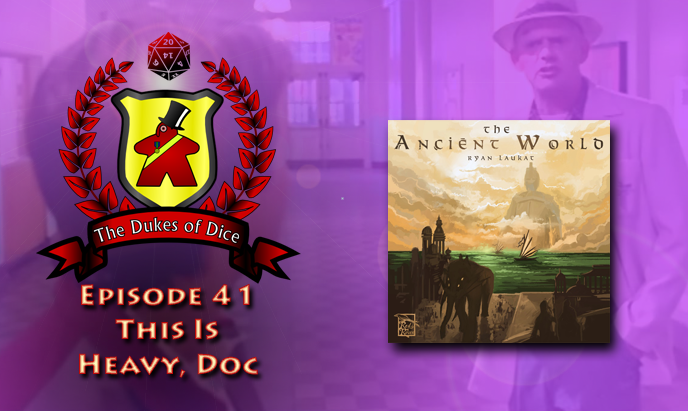 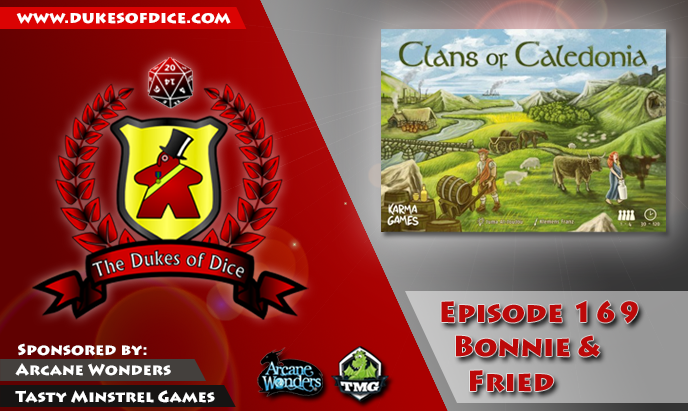 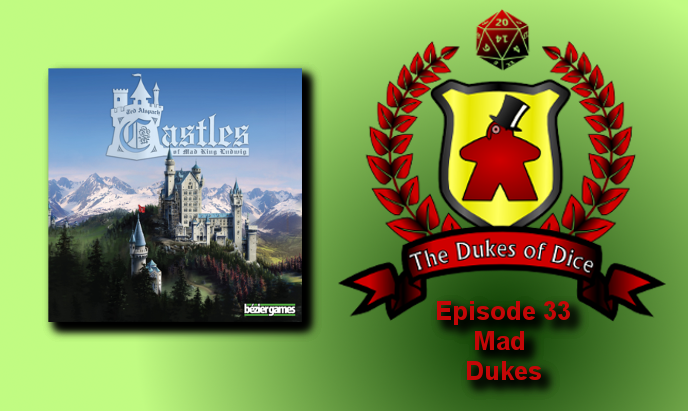 ... Look back at their review of Castles of Burgundy: The Dice Game in their Dukes' Double-Take (1:39:04). 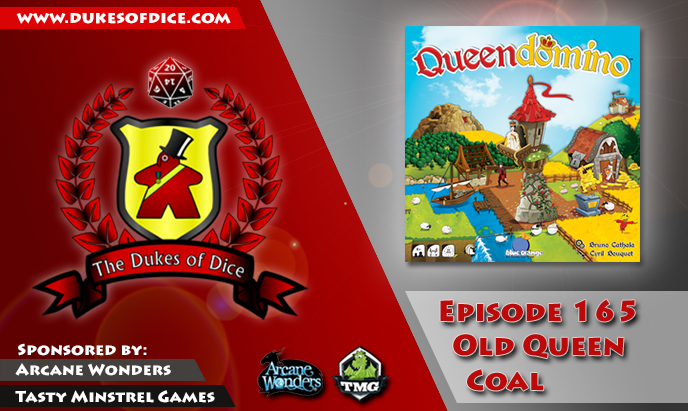 ... Look back at their review of Queendomino in their Dukes' Double-Take (1:23:25). 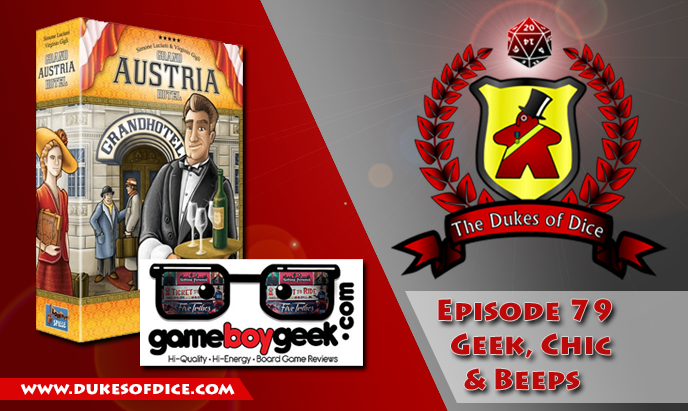 ... Look back at their review of Lisboa in their Dukes' Double-Take (1:51:50). 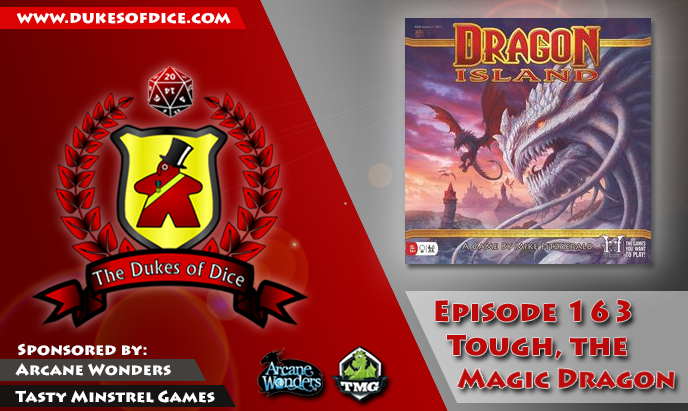 ... Look back at their review of Dragon Island in their Dukes' Double-Take (1:10:45). 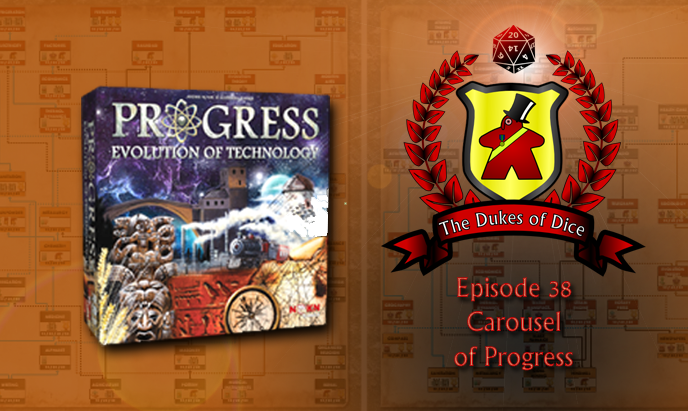 The new Kickstarter for the fantasy high school RPG Americana. 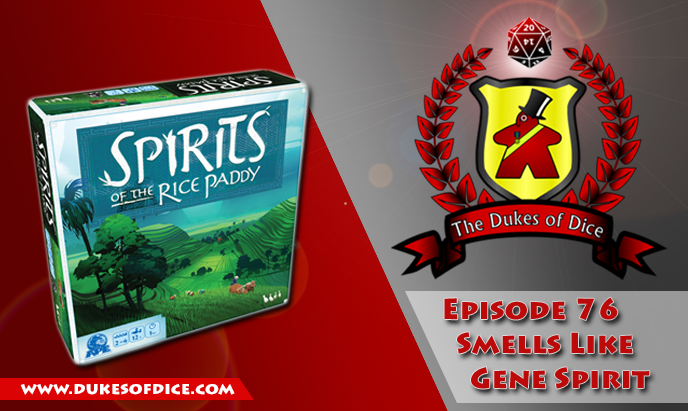 ... Look back at their review of Spirit Island in their Dukes' Double-Take (1:19:45). 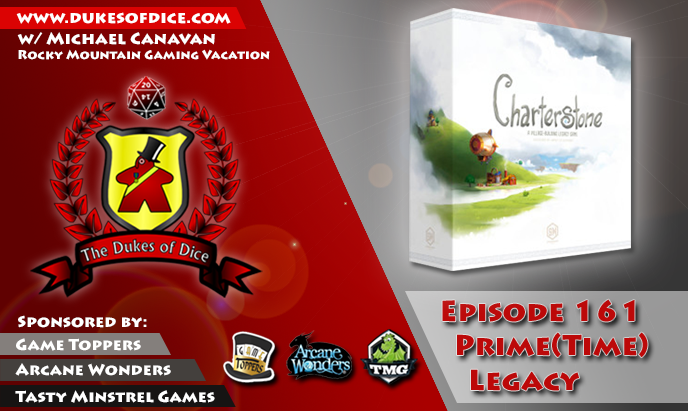 The new Kickstarter for The Climber's XL from Capstone Games. 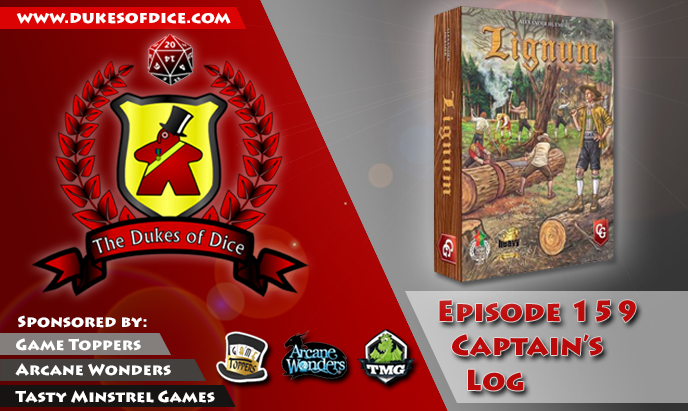 ... Look back at their review of Lignum in their Dukes' Double-Take (1:19:16). 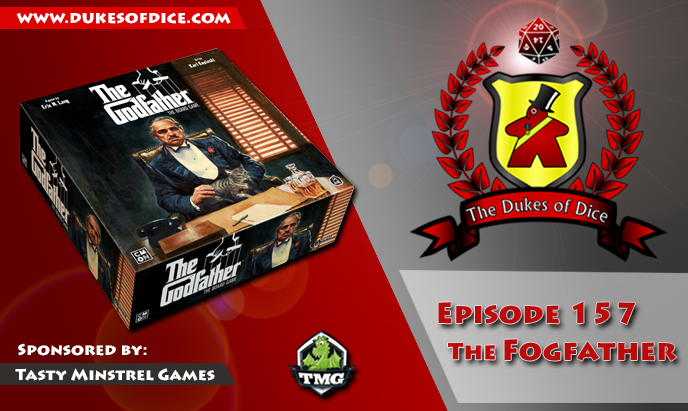 ... Look bat at their reviews of Downforce, Indulgence and The Godfather: Corleone's Empire in their Dukes' Double-Take (1:35:48). 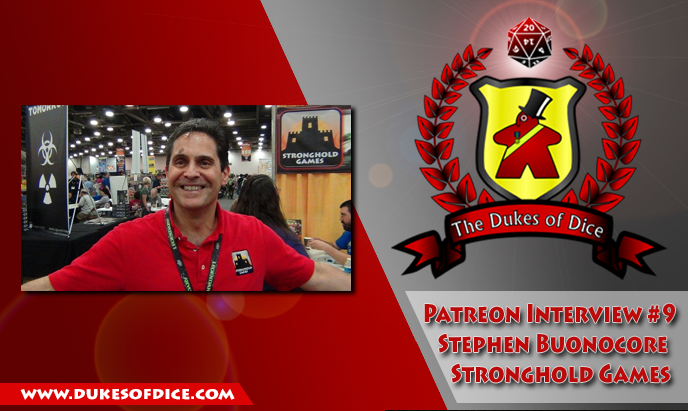 This episode Sean is on his own at SeanCon 2018. 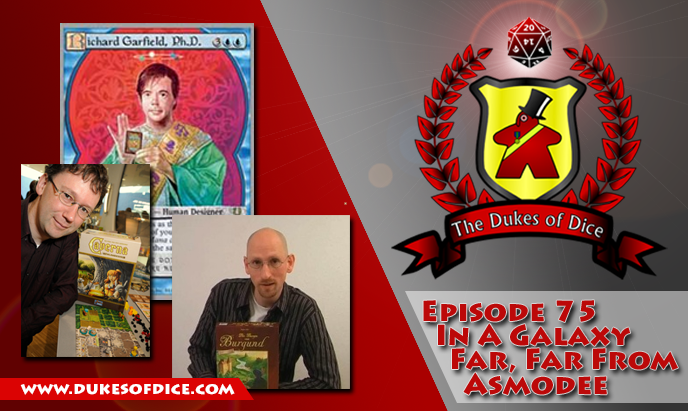 He's joined by special guests Ellison Davis and Andrew Heflich. 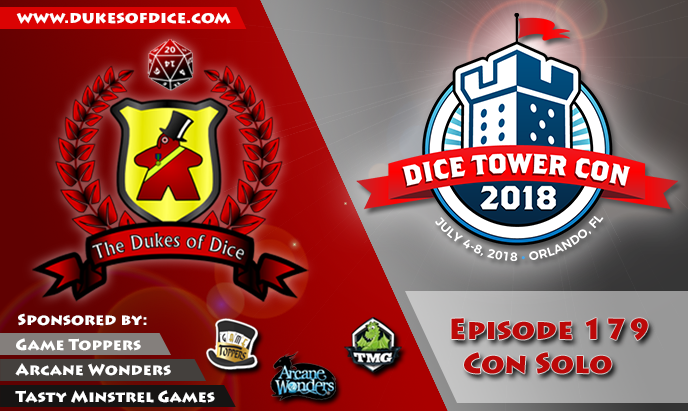 This episode Alex is on his own at Dice Tower Con 2018... fortunately he gets some help from Ellison Davis, Rory Veronda, Kevin "Burky" Burkhardsmeier, Duke Suzanne Sheldon and Phillip Millman. 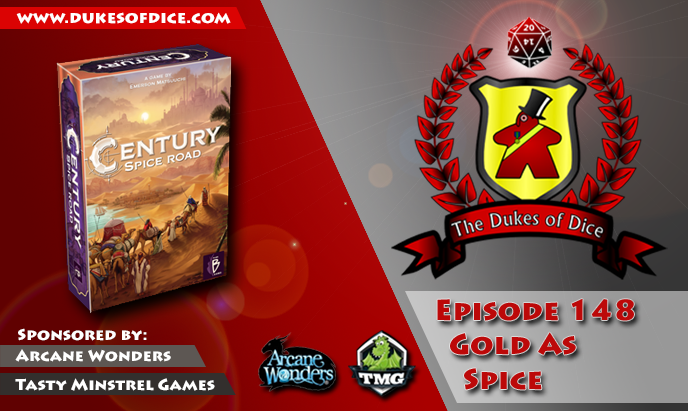 ... Look back at their reviews of Century Spice Road and Near and Far in their Dukes' Double Take (38:53). 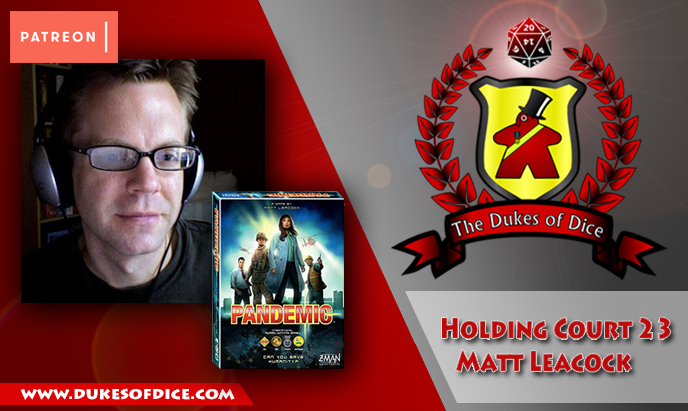 This episode, Alex sits down with Matt Leacock - the designer of Pandemic and its progeny! 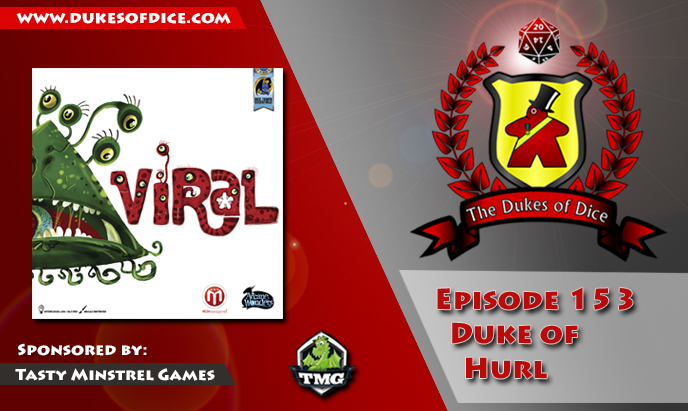 The two discuss board game design, Pandemic and of course ice cream! 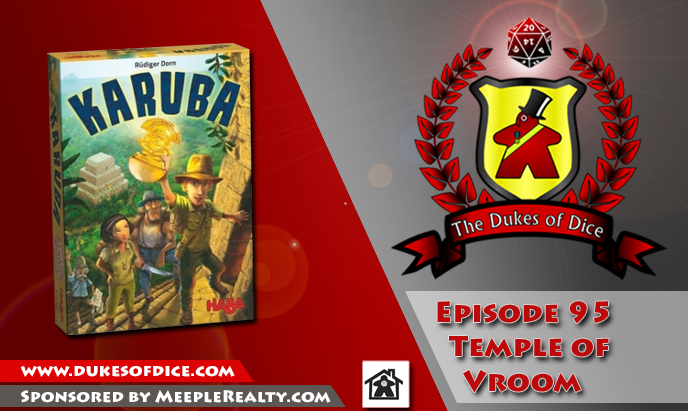 ... 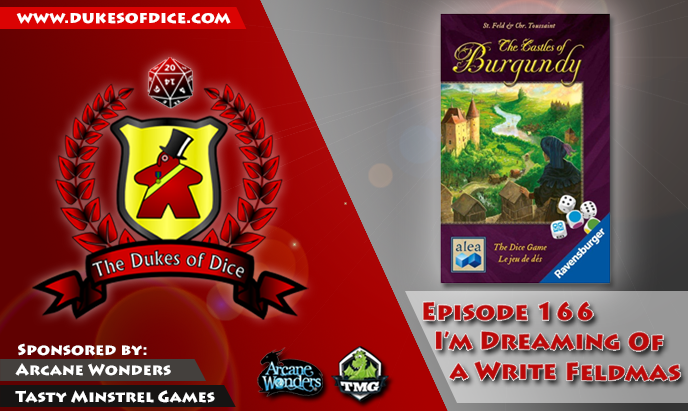 Discuss gaming burnout (1:14:14). 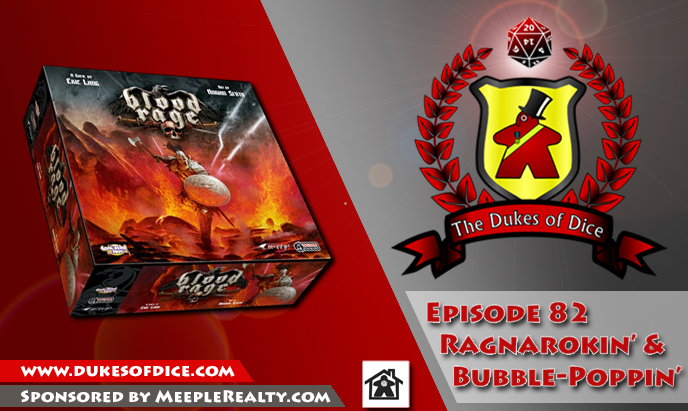 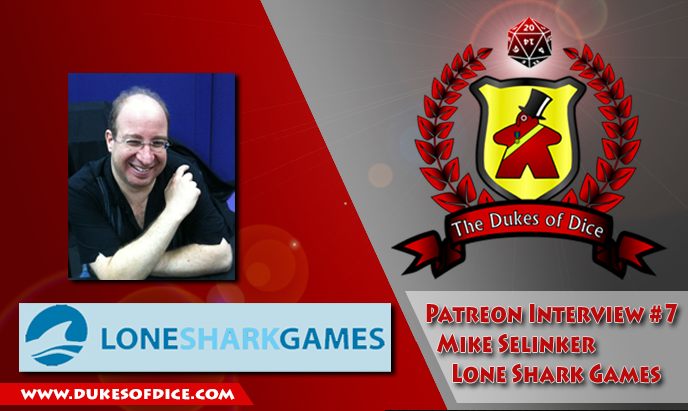 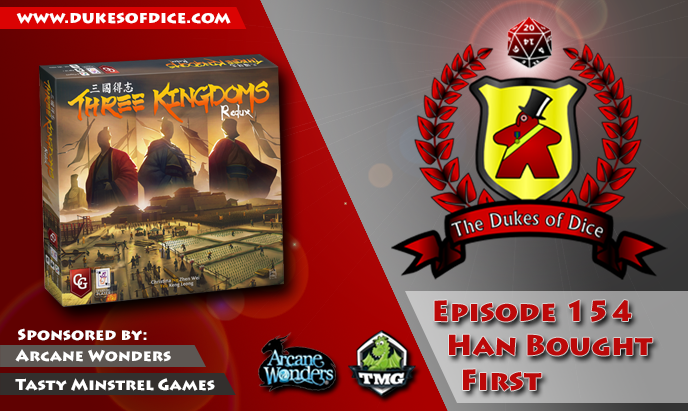 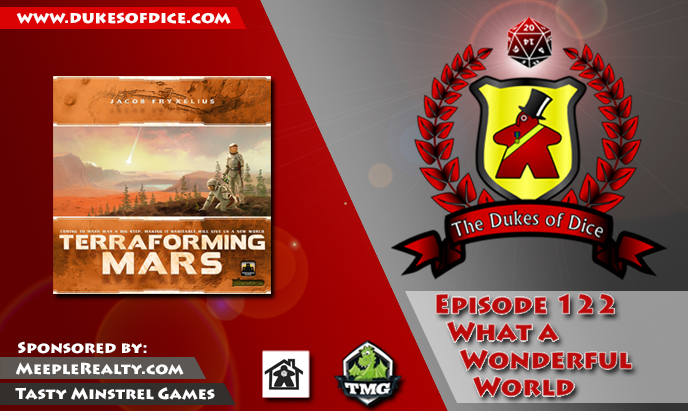 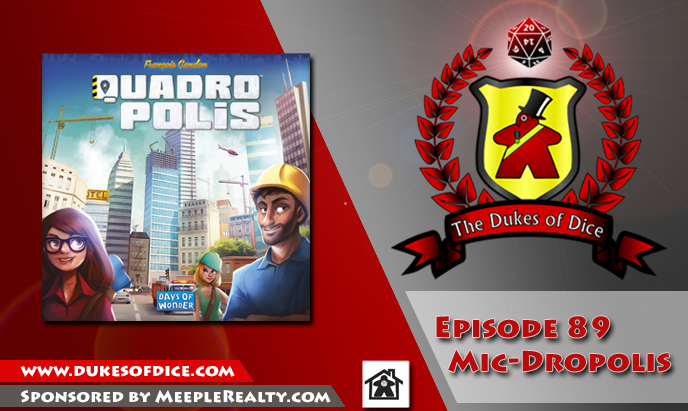 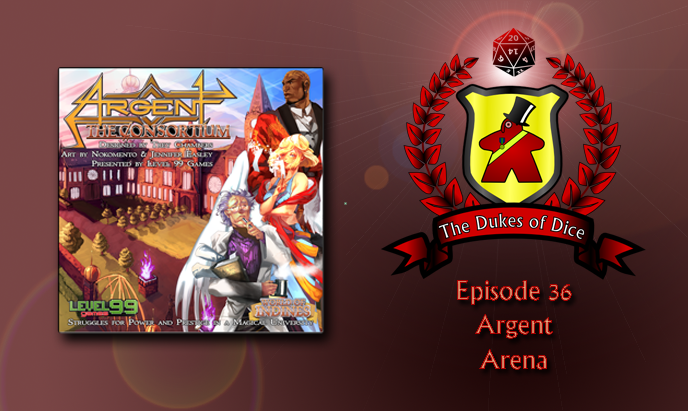 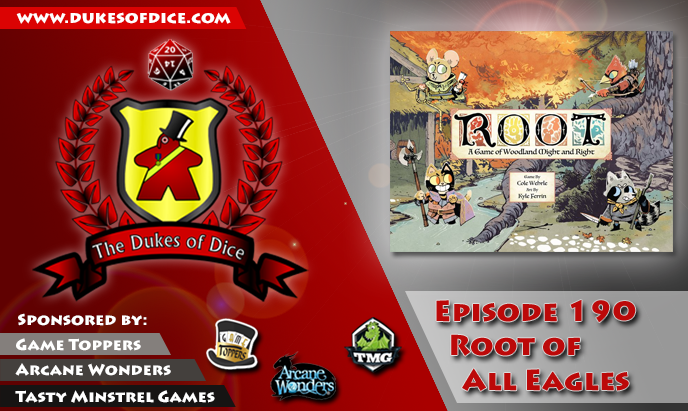 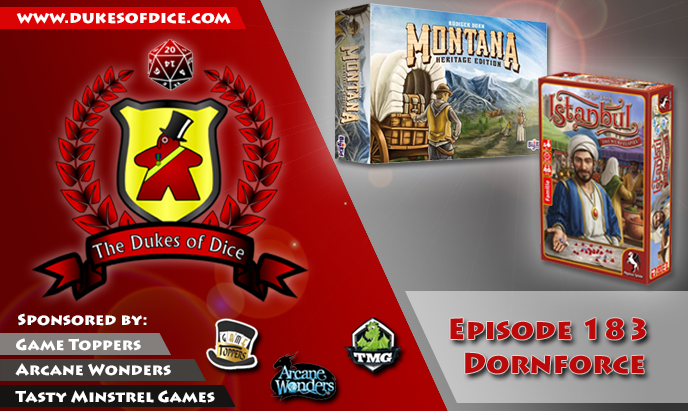 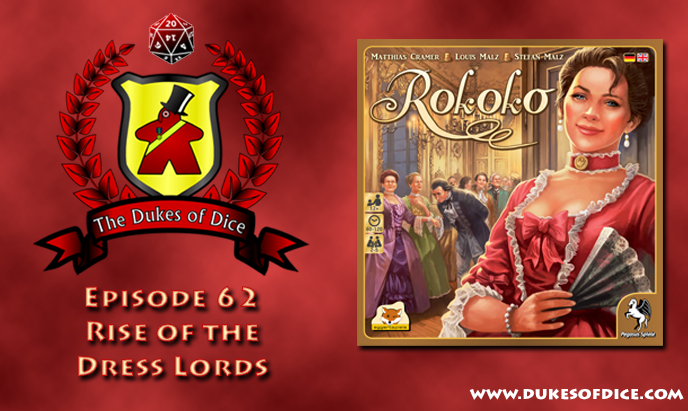 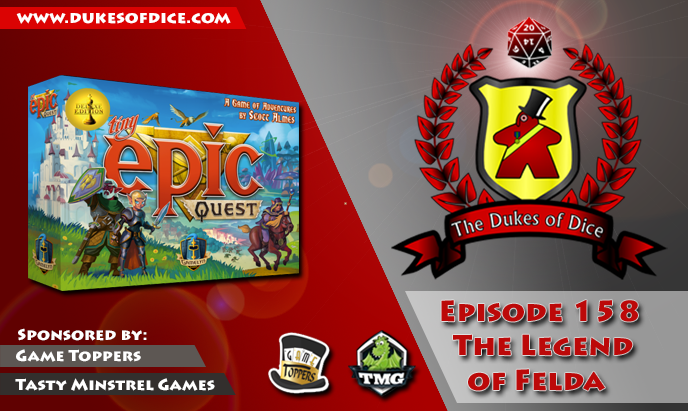 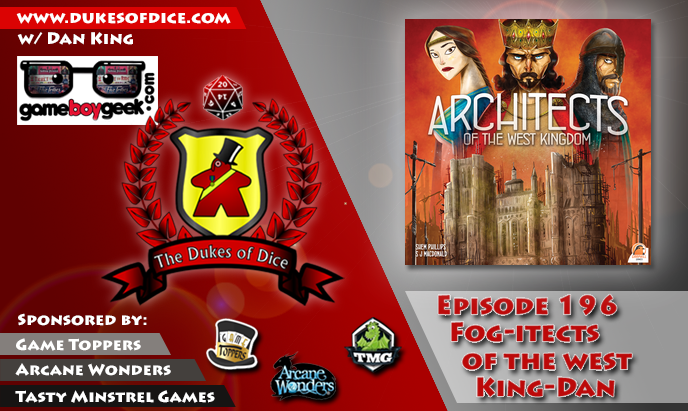 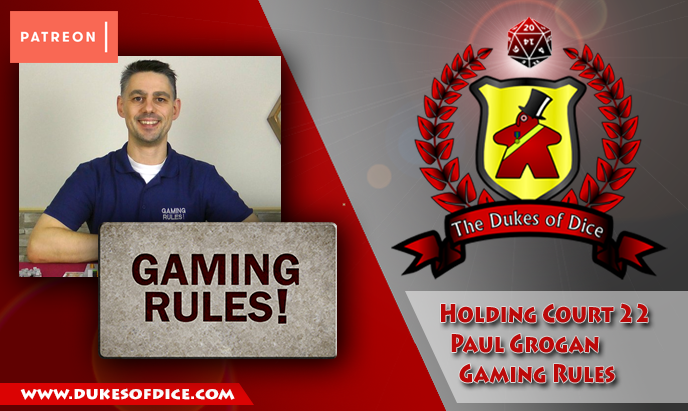 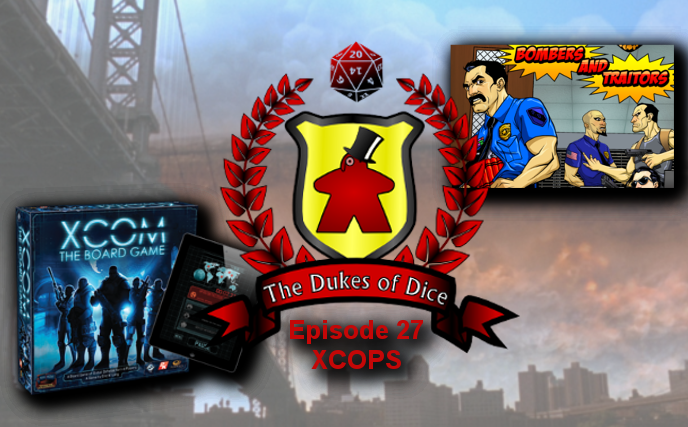 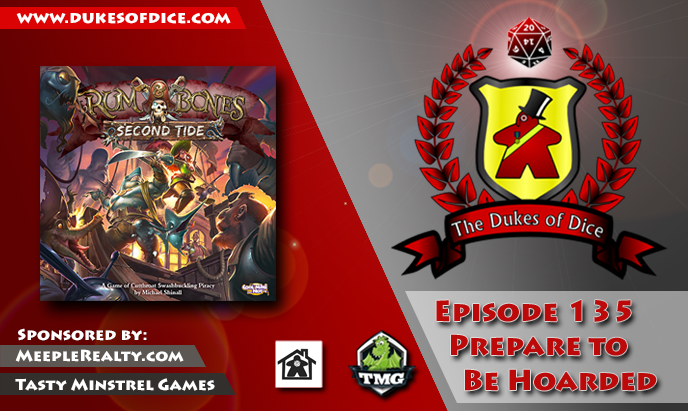 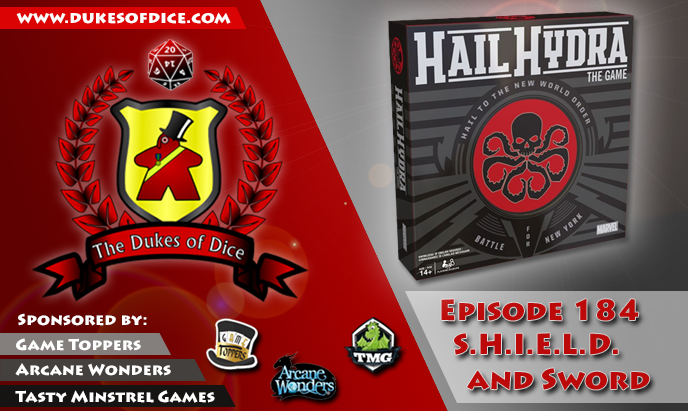 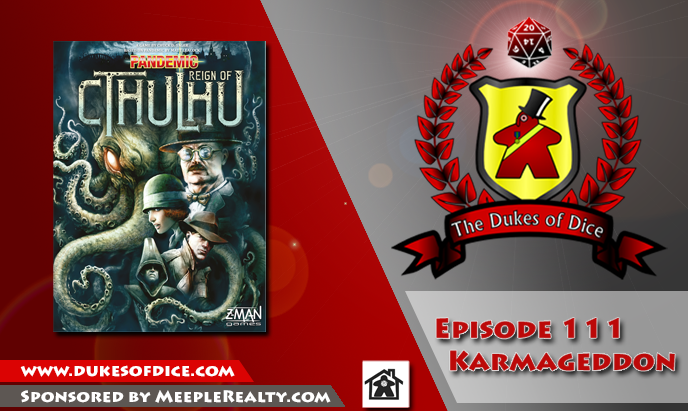 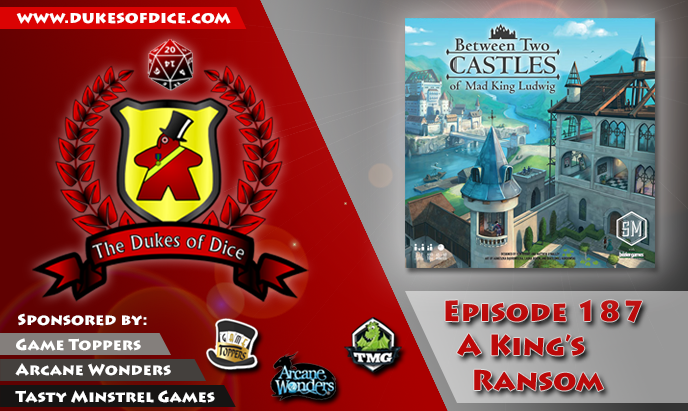 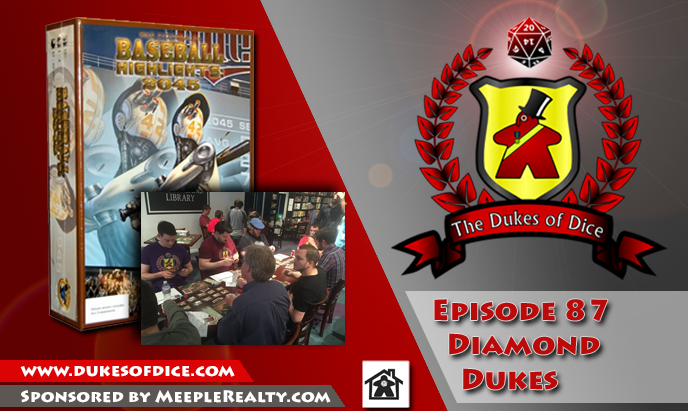 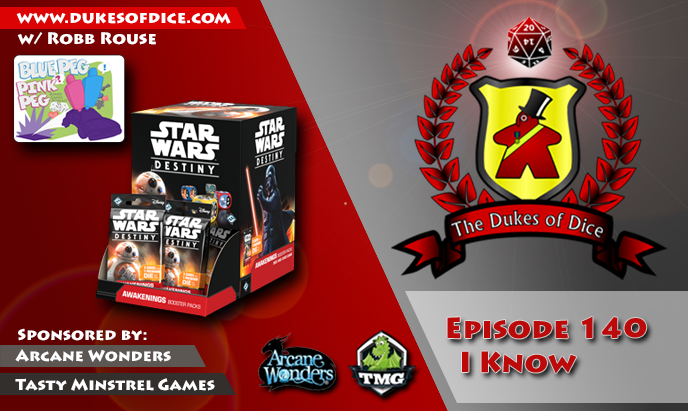 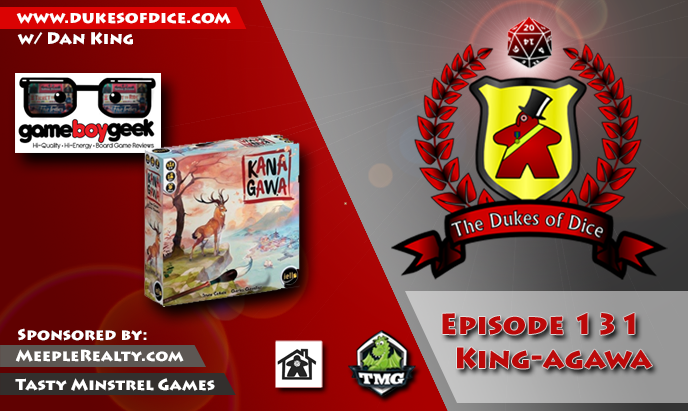 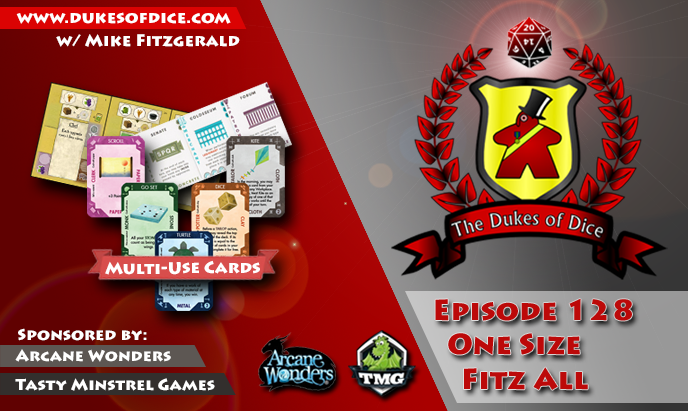 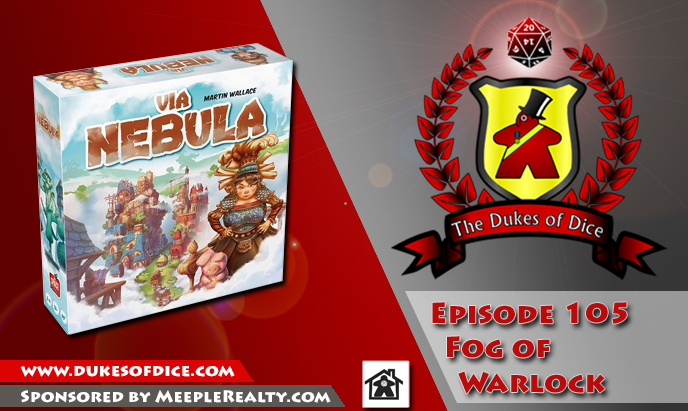 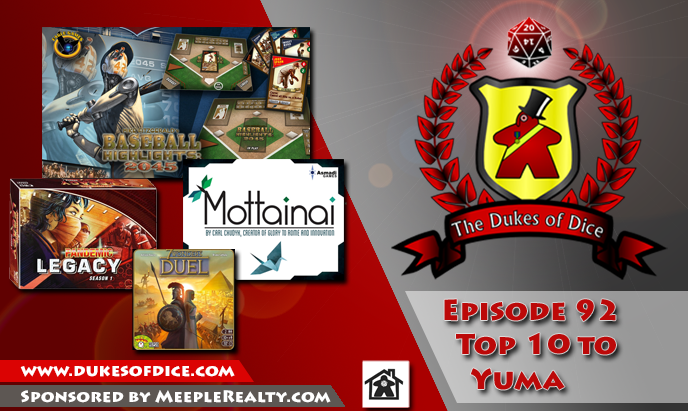 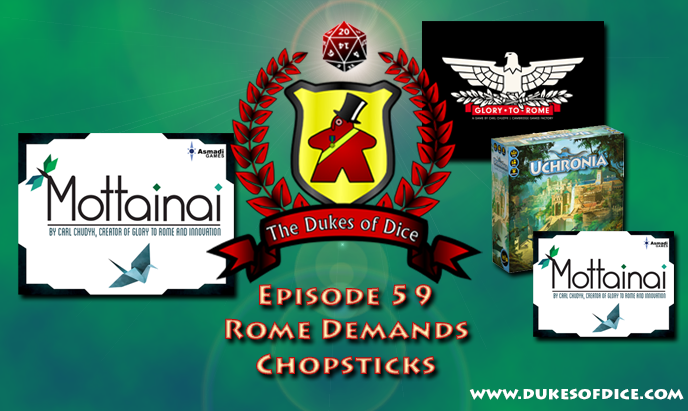 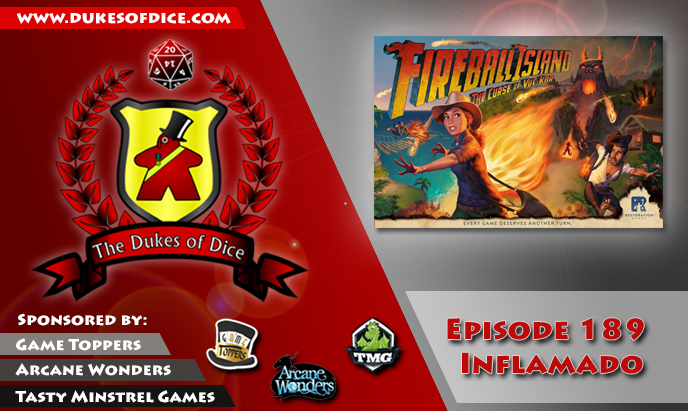 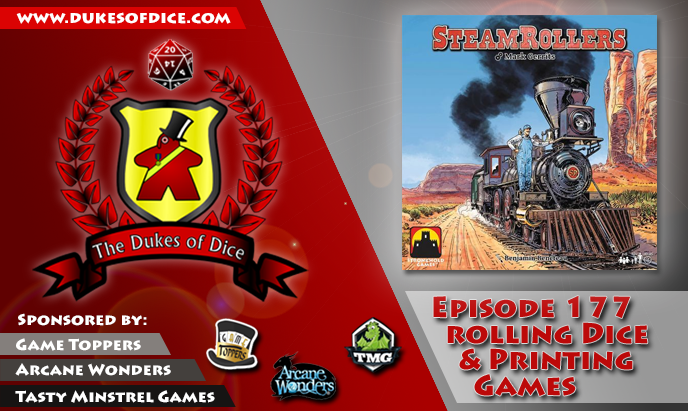 Dukes of Dice - Holding Court 22 - Paul Grogan - Gaming Rules! 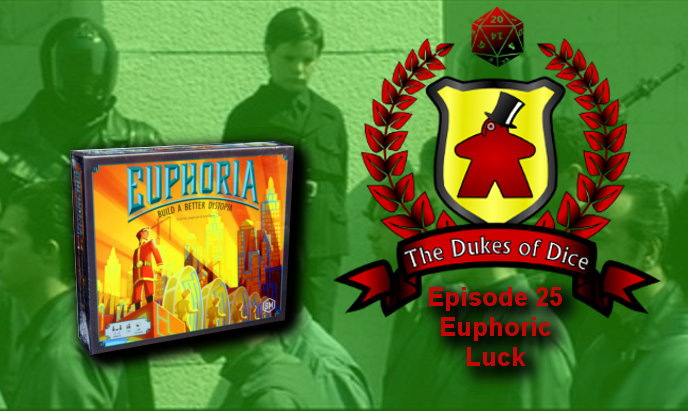 ... Look back at their reviews of Oracle of Delphi, Blood of an Englishman and Capital Lux in their Dukes' Double Sextuple-Take. 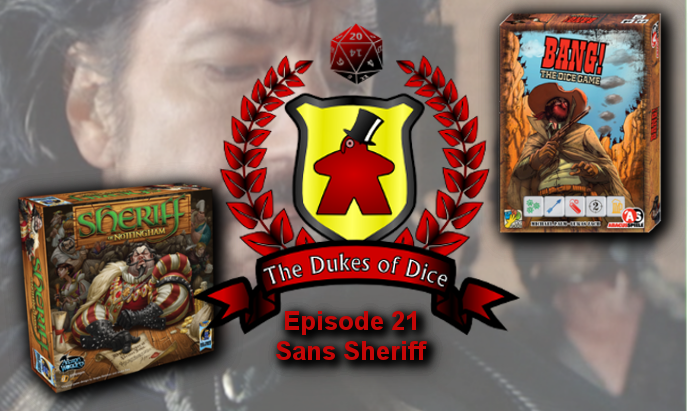 (1:21:00). 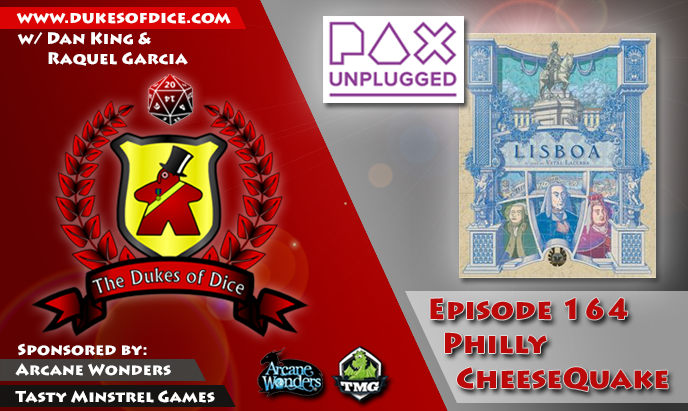 ... Alex reports back from the first ever PAX Unplugged in Philadelphia, PA with a little help from the Game Boy Geek (1:08:19). 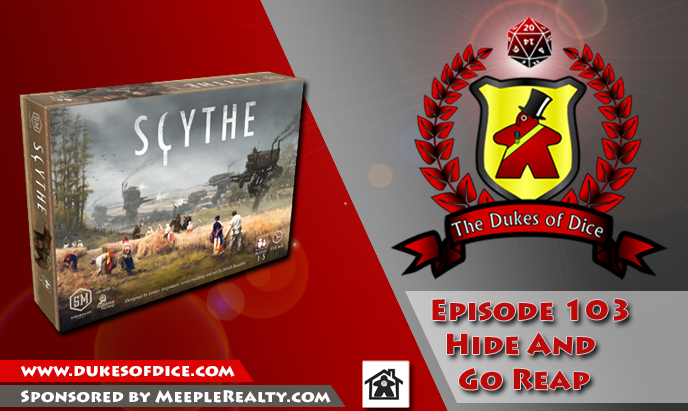 ... Look back at their reviews of Scythe and Via Nebual in their Dukes' Double-Take (1:28:24). 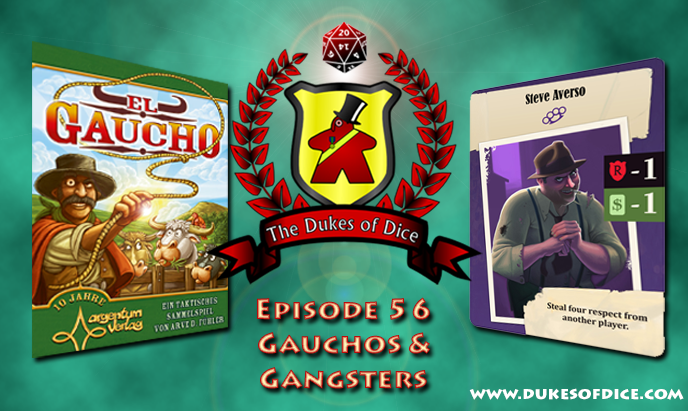 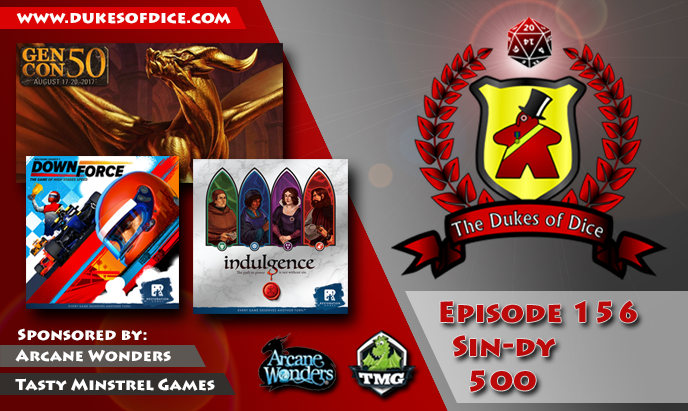 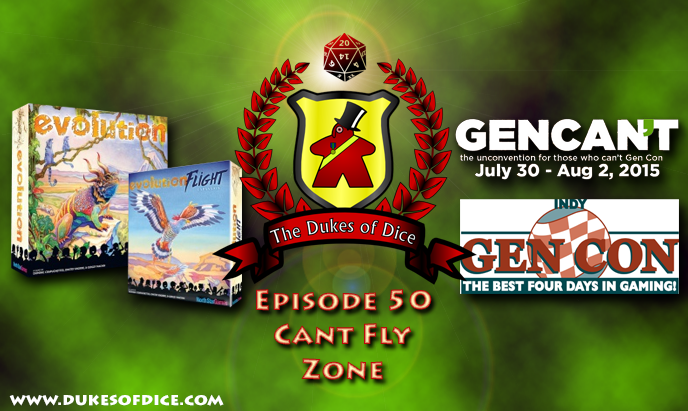 Then the Dukes review two hot games from GenCon 50, both from Restoration Games: Down Force (1:17:46) and Indulgence (1:37:31). 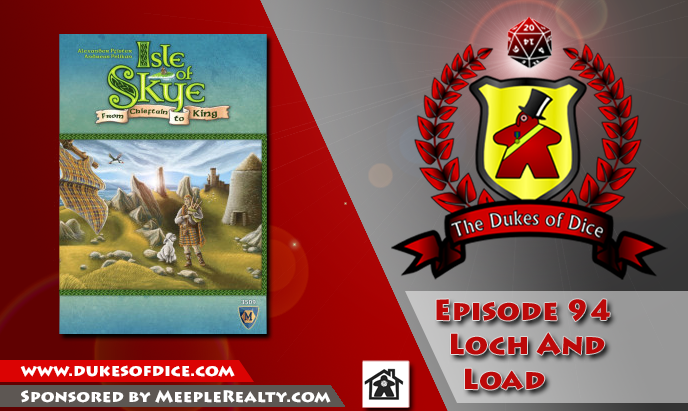 ... deliver their State of the Duchy (1:33:02). 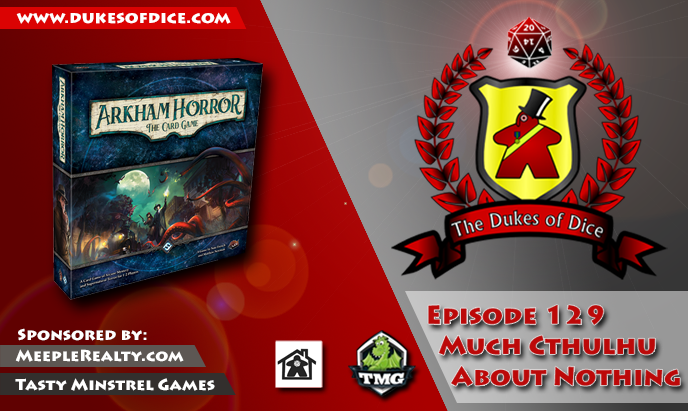 ... Share a chilling imagining a world without hobby board games from listener Michael Fahrenbruch (1:25:33). 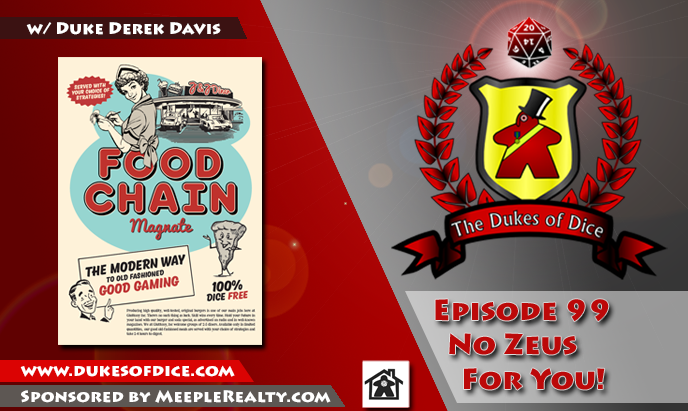 ... Look back at their review of Food Chain Magnate in their Dukes' Double-Take (1:23:29). 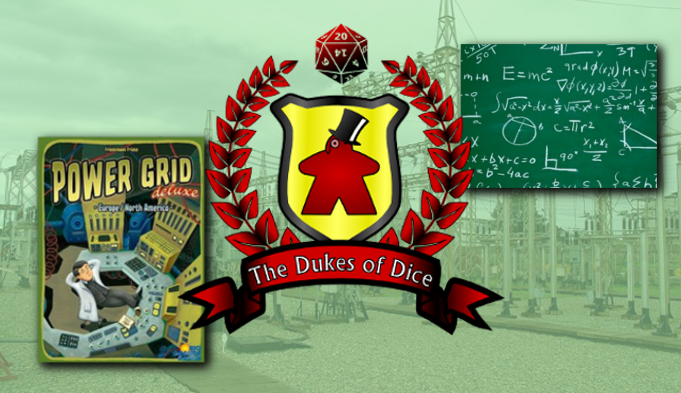 ... 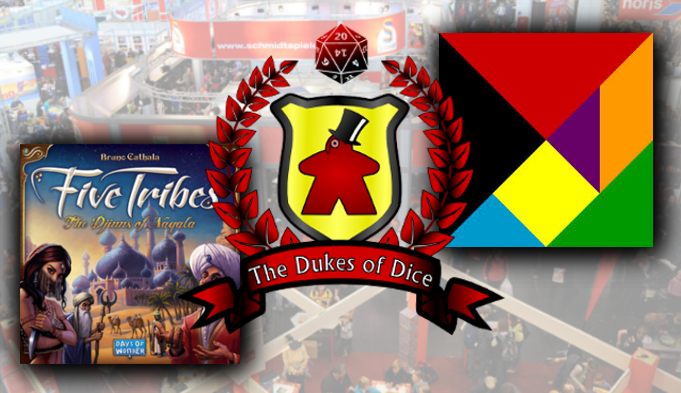 Discuss what types of games might qualify as "insta-buys" (1:30:37). 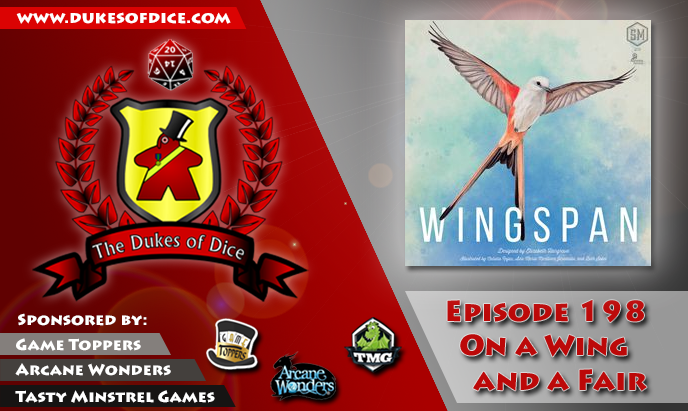 This episode, Alex sits down with Kwanchai Moriya, artist for games like Dinosaur Island, Capital Lux, Catacombs and more! 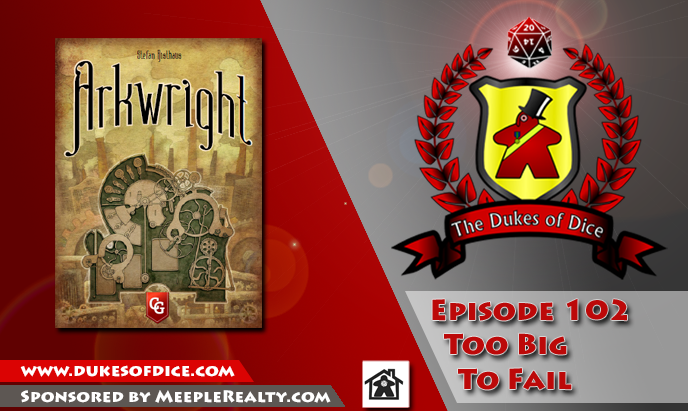 The two discuss the board game art and design industry! 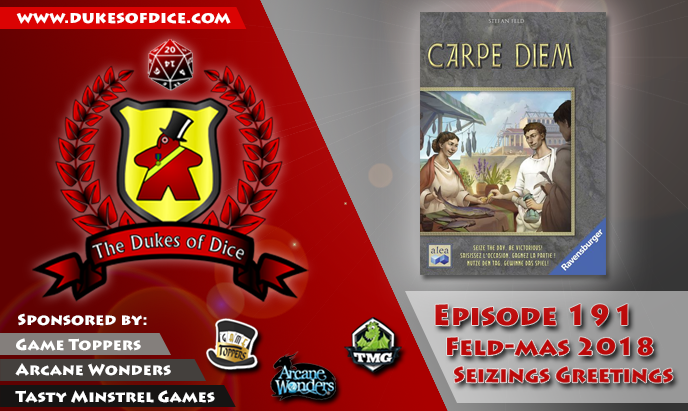 ... 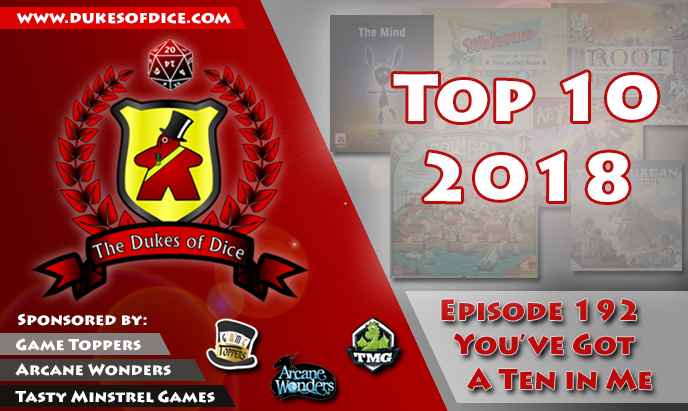 Discuss their votes for this year's Dice Tower Awards (1:14:04). 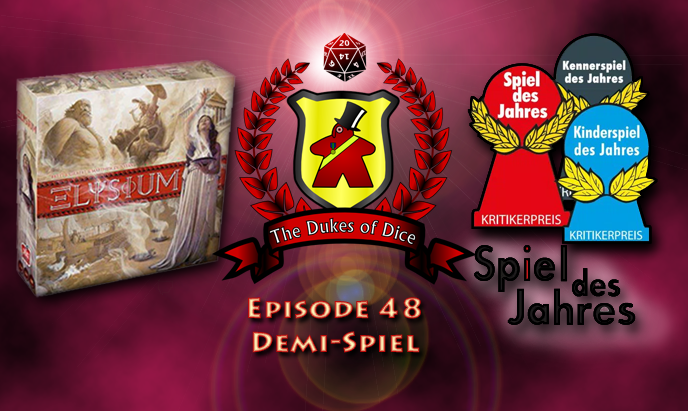 ... 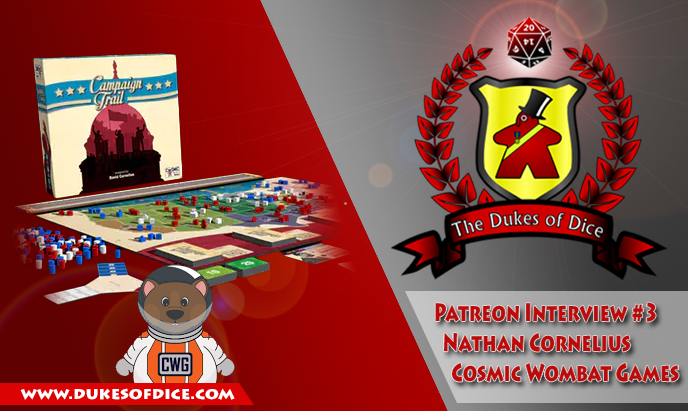 Sit down with MAtthew Ward from WAM to discuss his recent experience at Heavy Con 2017 (1:35:30). 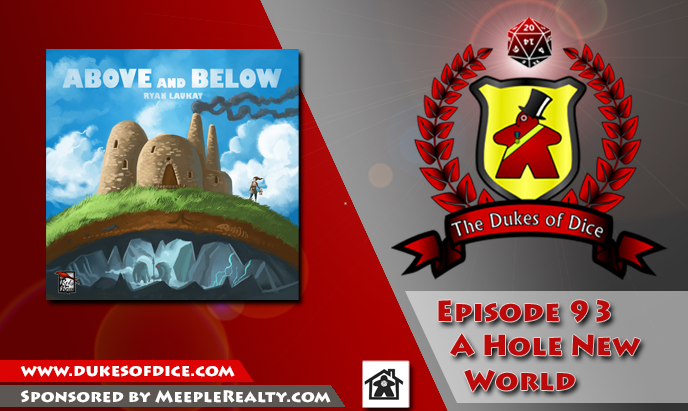 ... Look back at their review of Above and Below in their Dukes' Double-Take (1:02:16). 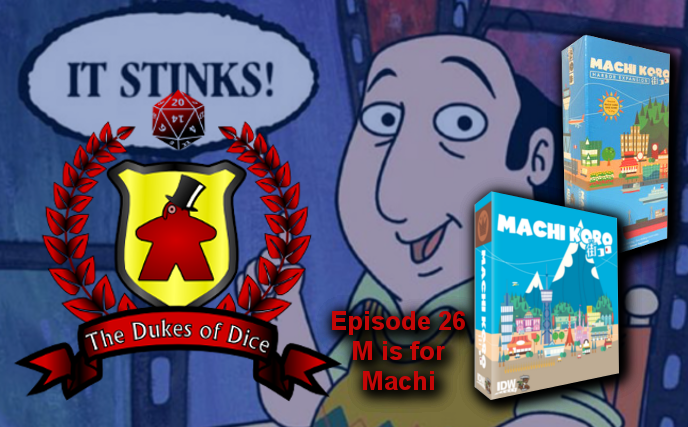 ... 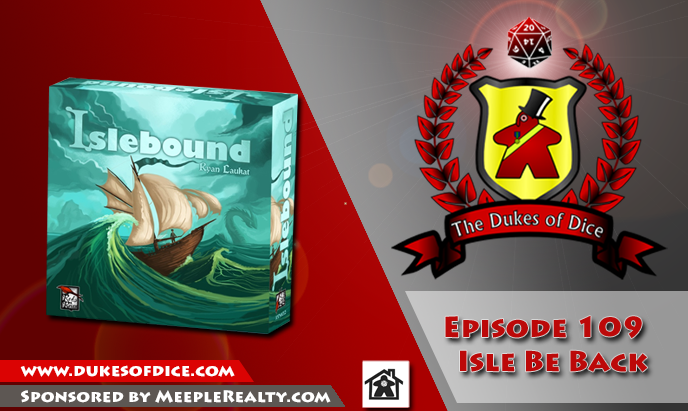 Discuss importing board games (1:15:47). 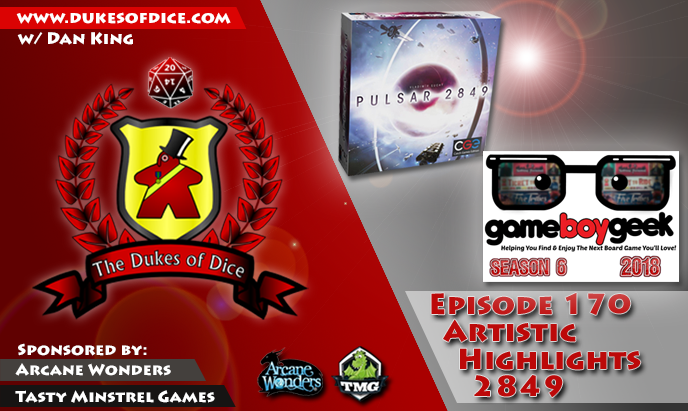 This episode, Alex sits down with Rob Daviau, co-designer of Pandemic Legacy: Season 1 and Chief Restoration Officer at Restoration Games! 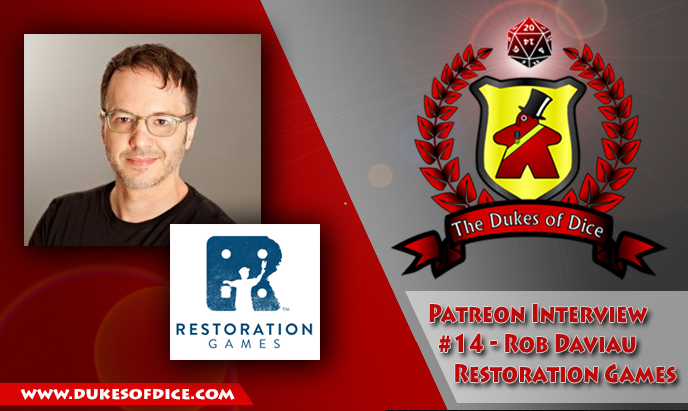 The two discuss Rob's long career at Hasbro, the ups and downs of legacy games, and the new aim of Restoration Games! 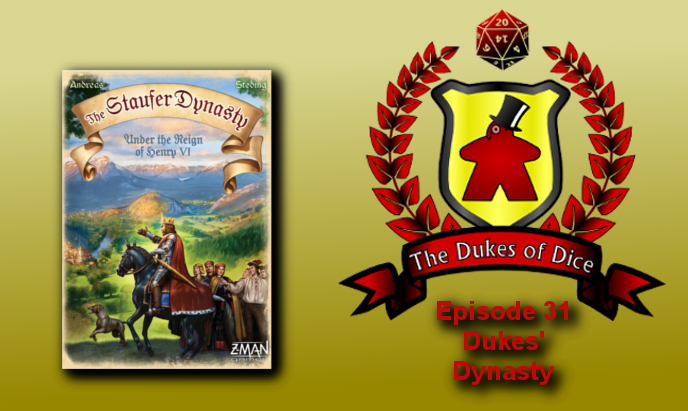 This episode the Dukes are finally back together... Alex has returned! 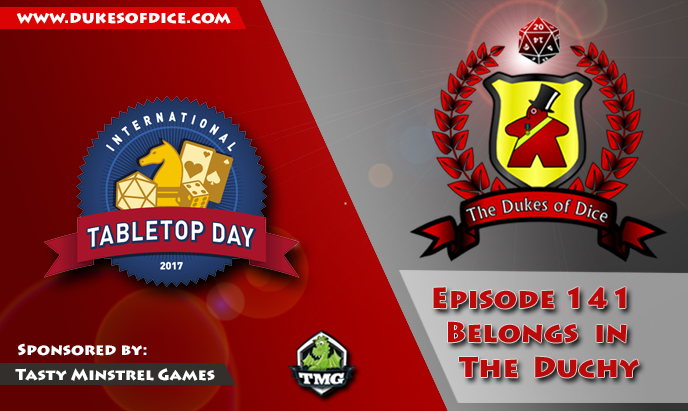 The two recount their tales of International Tabletop Day 2017. 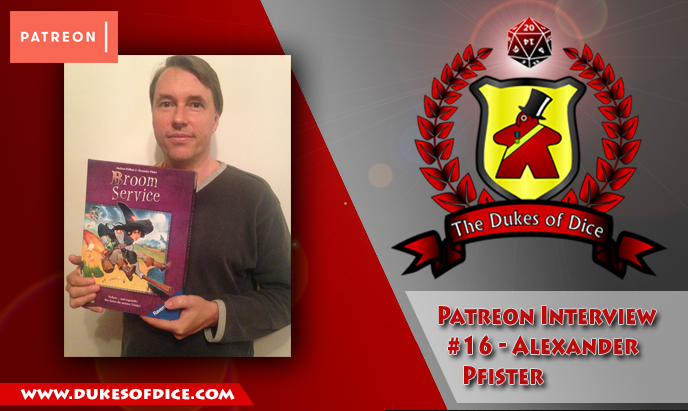 Then Alex discusses his recent whirlwind trip across the world. 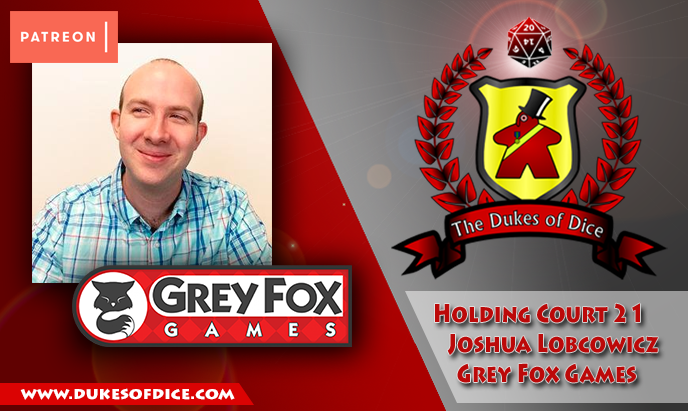 Finally, Alex answers some questions from the Duchy Mailbag. 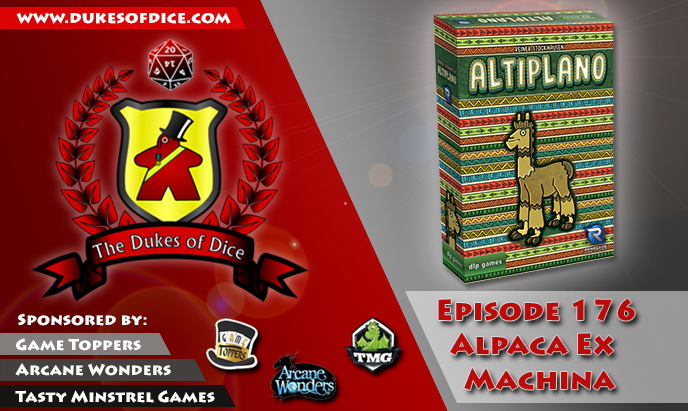 ... 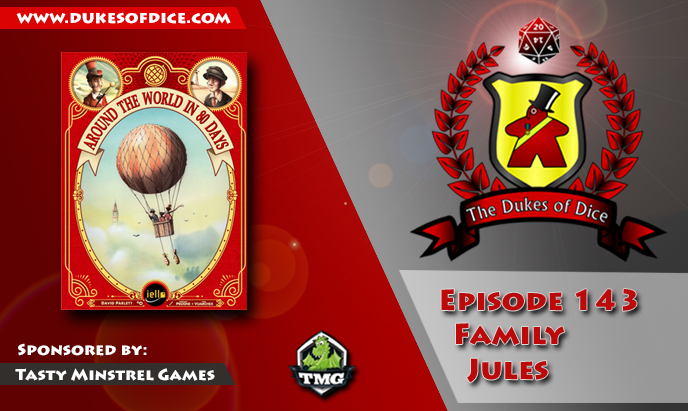 Discuss the role of relationships and family in board gaming (1:38:32). 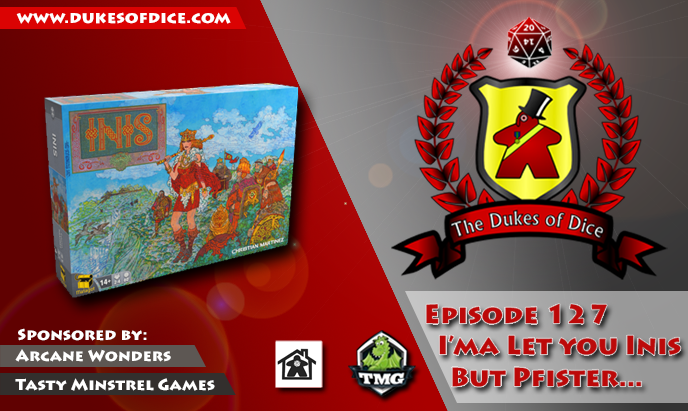 ... 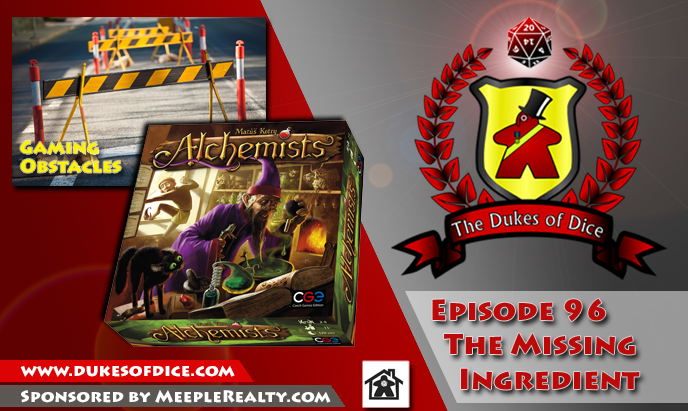 Discuss time as a mechanic and resource in board games (1:08:07). 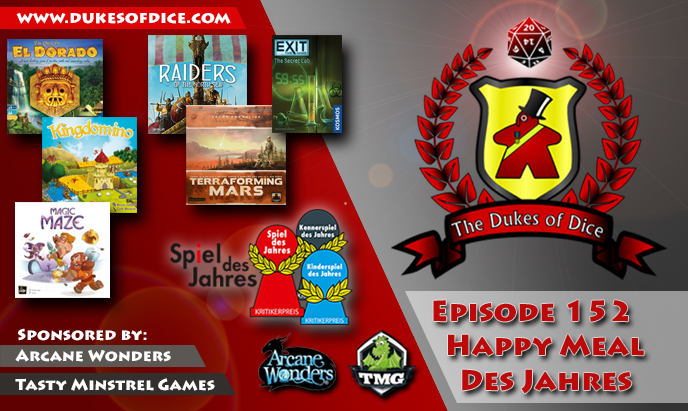 ... Re-theme some games suggested by the listeners (1:52:27). 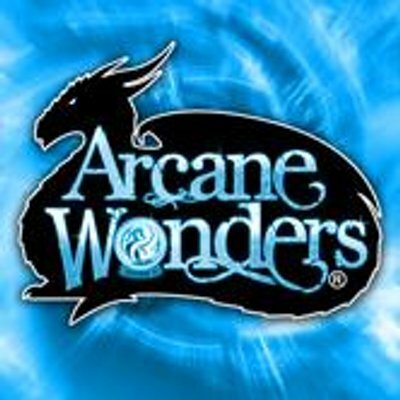 ... 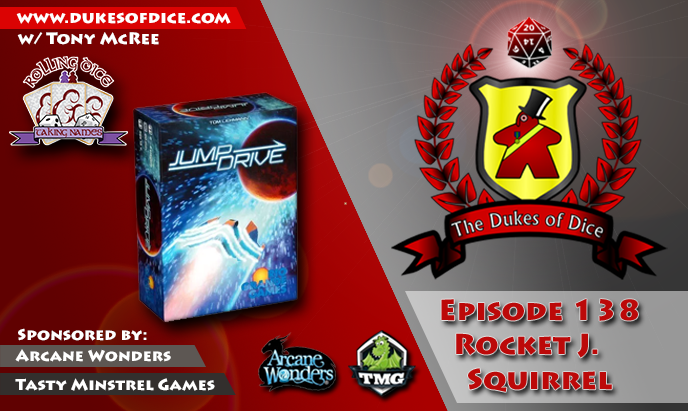 Discuss games that they keep that they're not necessarily crazy about (1:22:26). 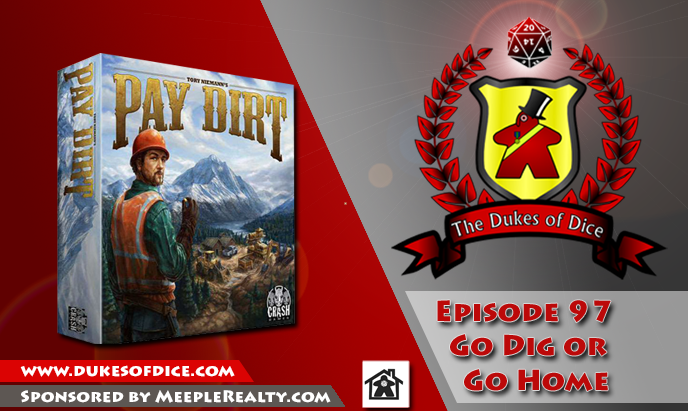 ... 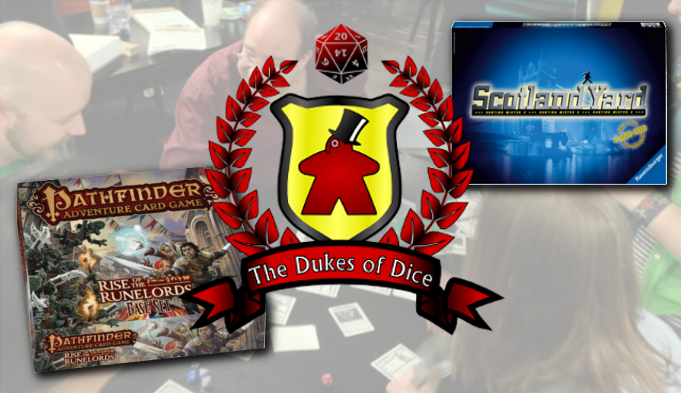 Discuss solo gaming (2:03:43). 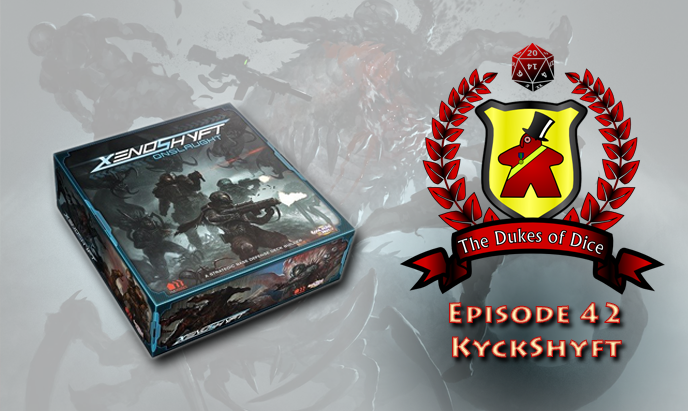 ... 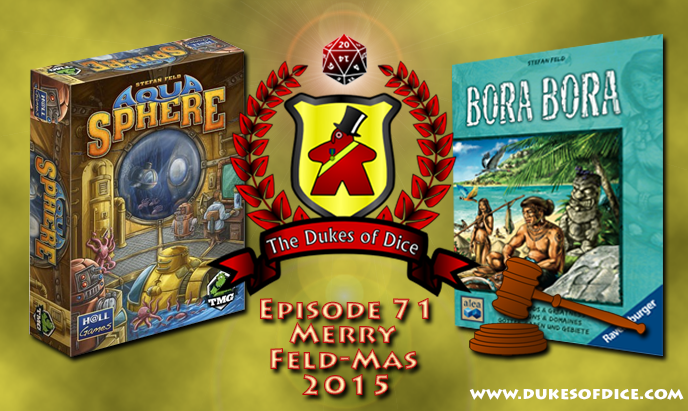 Discuss completionism in board games (1:28:14). 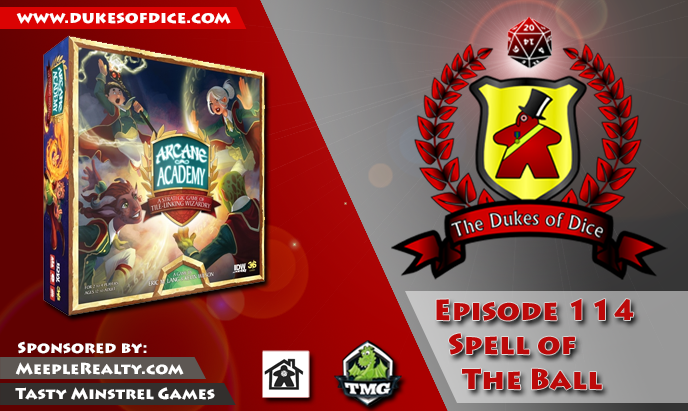 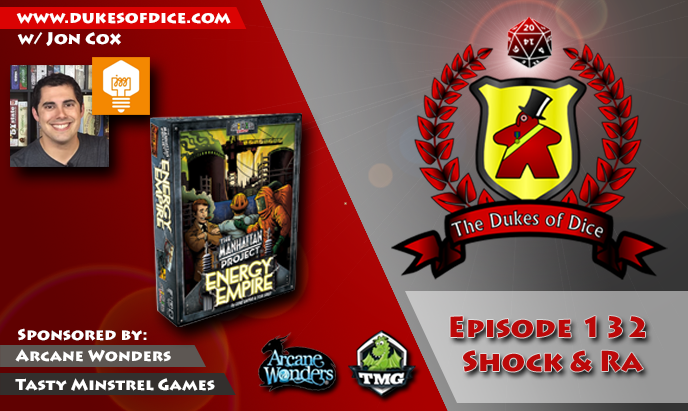 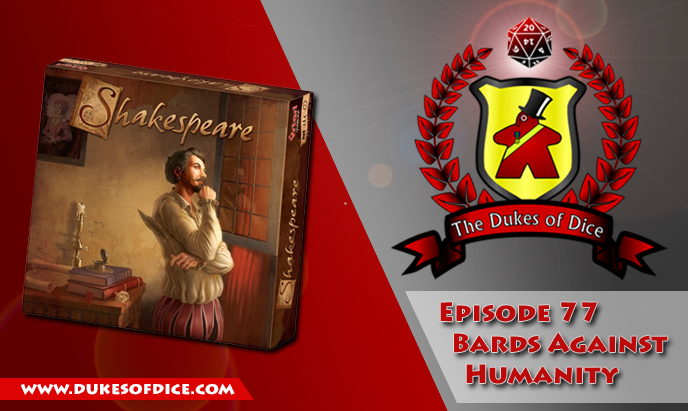 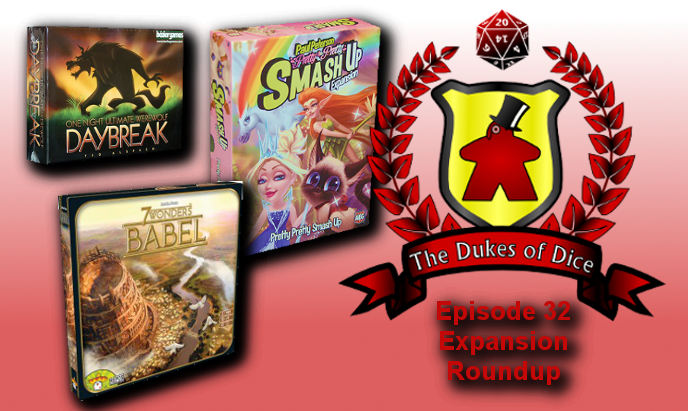 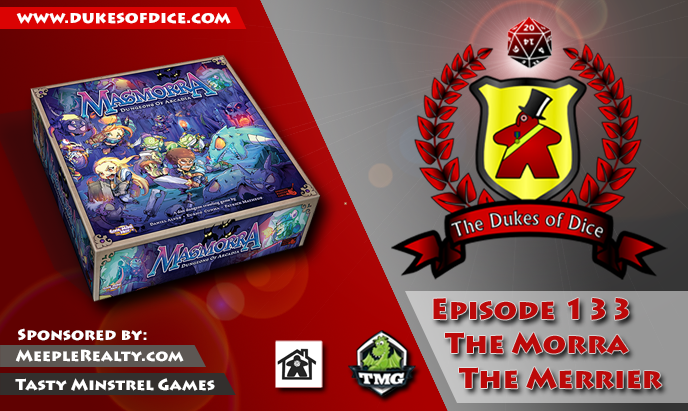 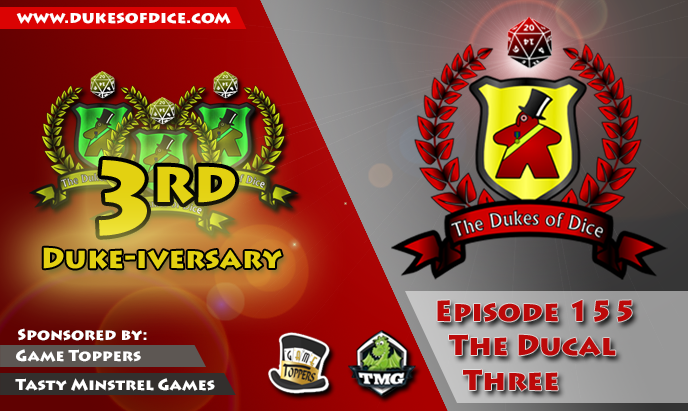 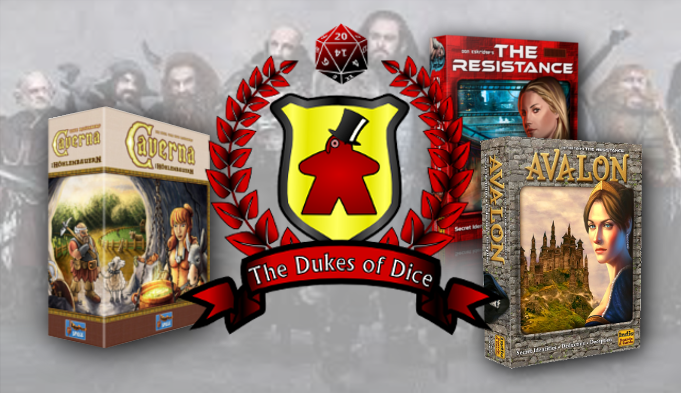 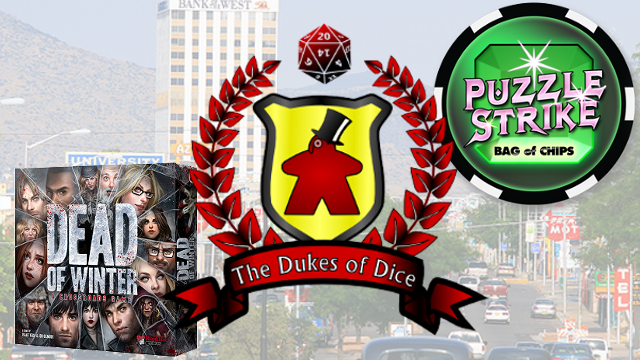 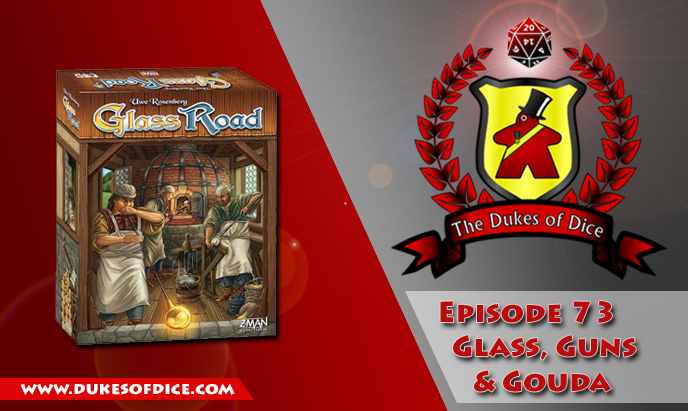 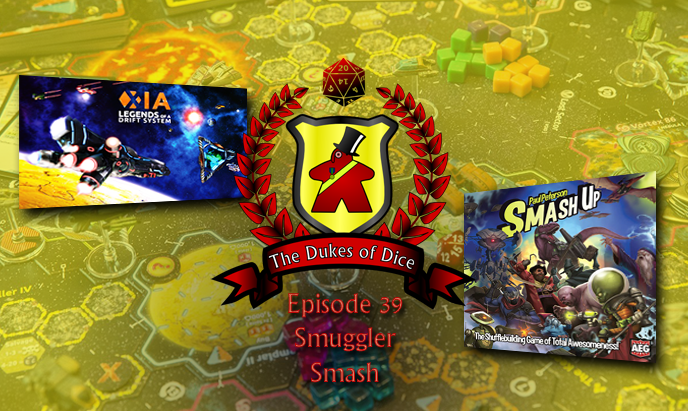 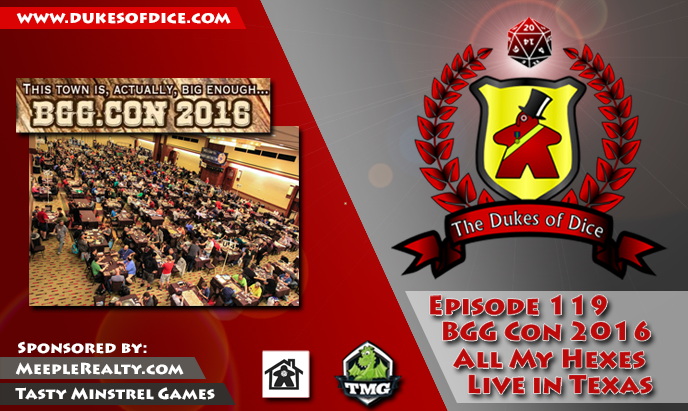 The Dukes have been nominated for the 2016 Golden Geek Awards for Best Board Game Podcast! 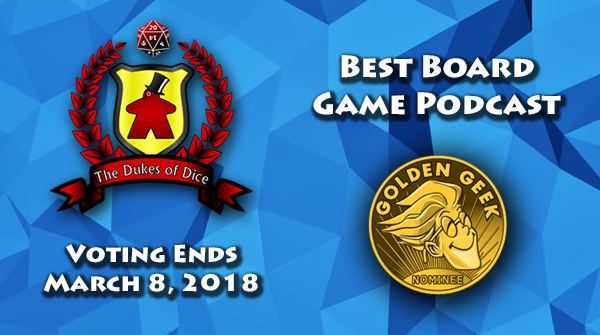 Click below to vote! 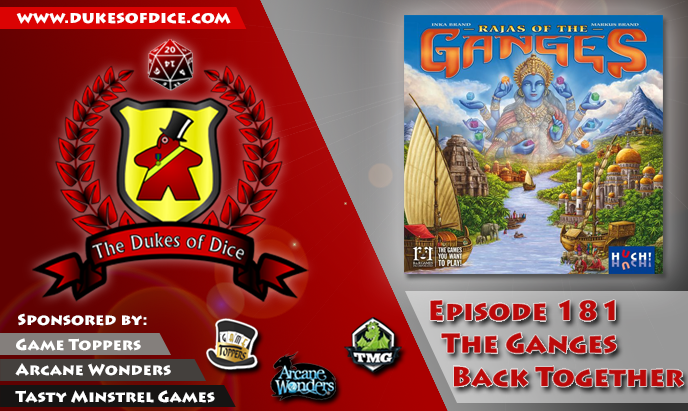 This episode, Alex sits down with Scott Gaeta, founder of Renegade Game Studios, publisher of Clank!, Gravwell, Lanterns and more! 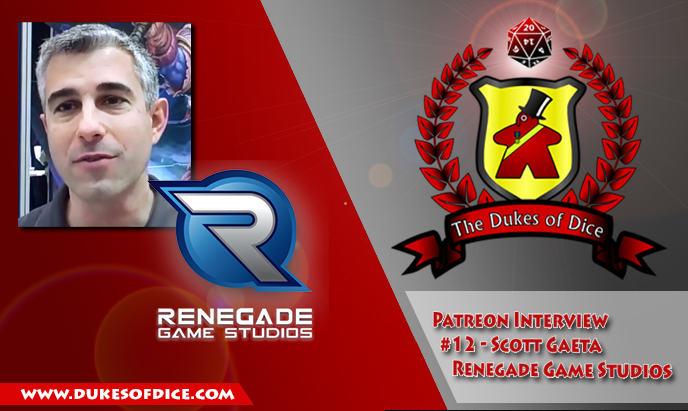 The two discuss Renegade's meteoric rise this last year and the ins and outs of board game publishing! 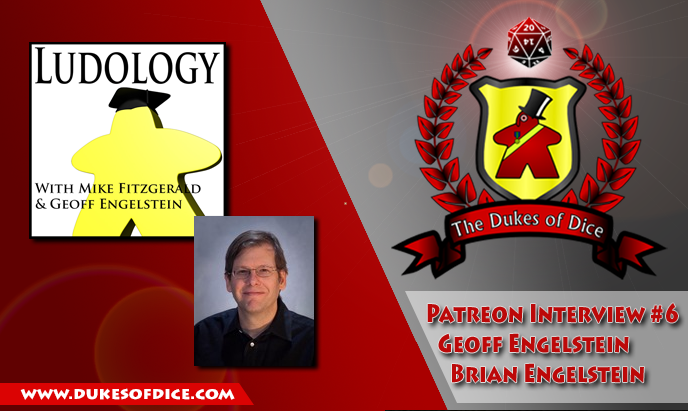 ... Answer listener question in the Duchy mailbag (01:00:28). 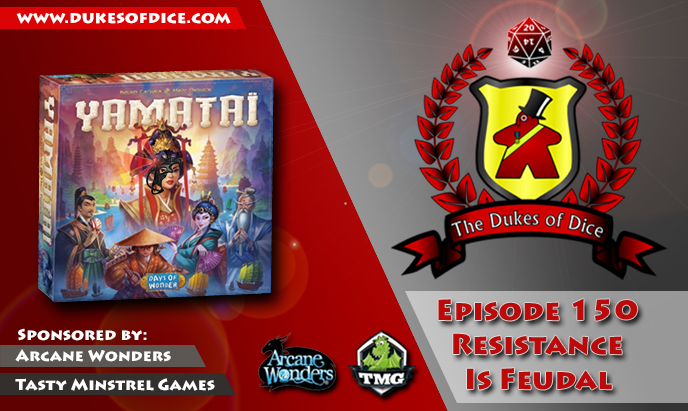 ... 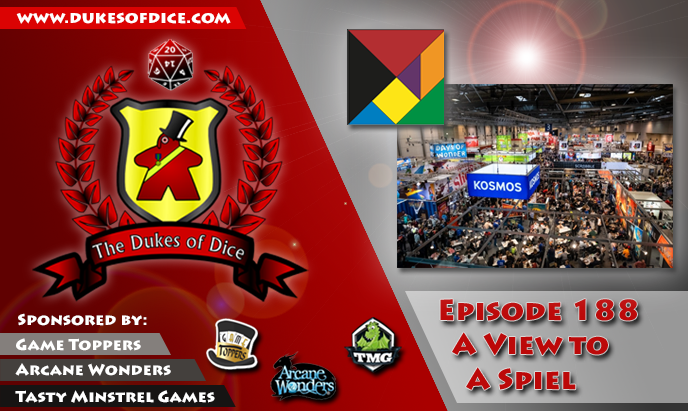 Discuss shared universes in board games (1:35:45). 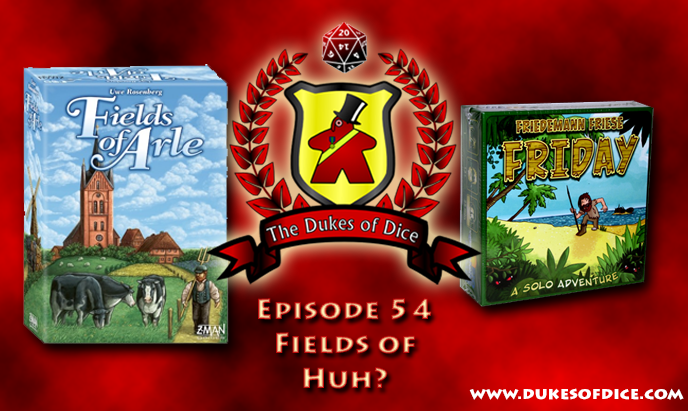 ... 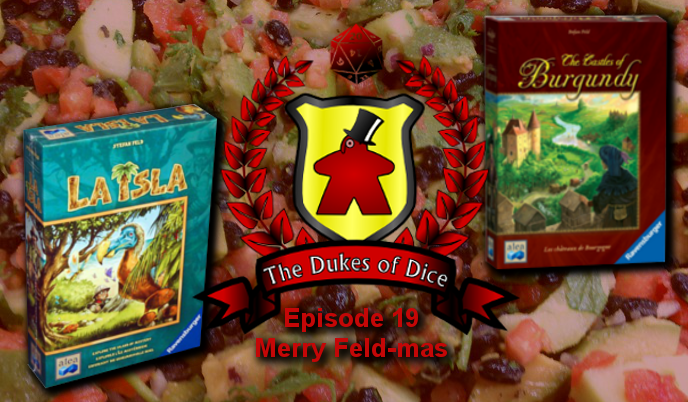 Discuss mundane tasks that might make great board games (1:23:13). 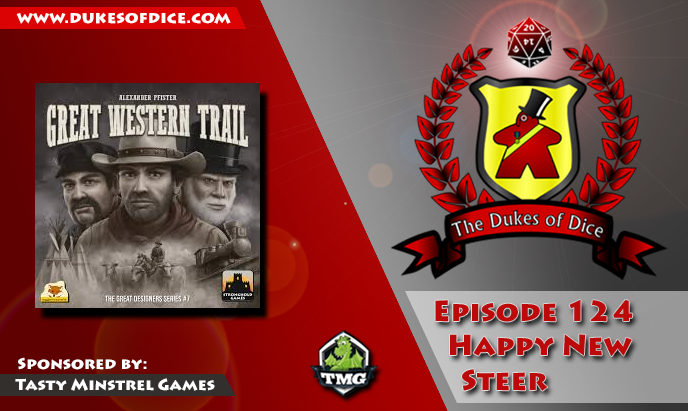 Don't forget... it's the last week of our Great Western Trail Giveaway, sponsored by Stronghold Games! 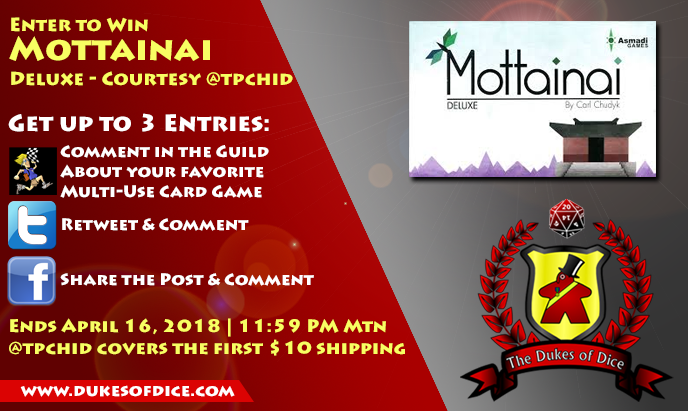 Click here for details on how to enter. 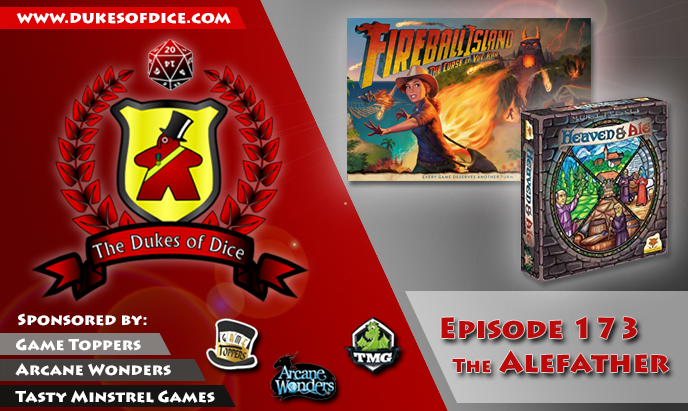 ... Solo travel games for Alex's upcoming trip (1:12:11). 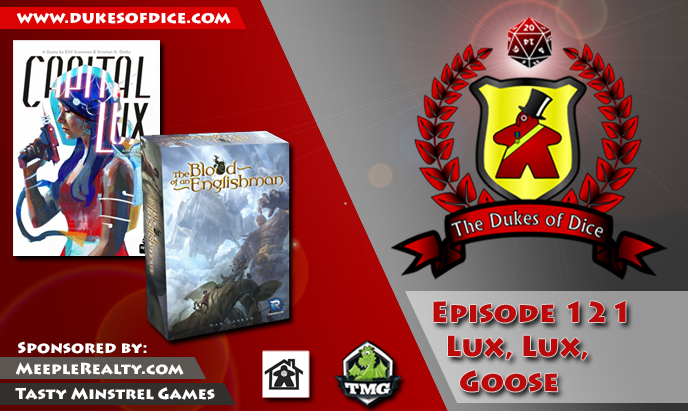 Don't forget to enter our Blood of an Englishman giveaway, entry details found here! ... 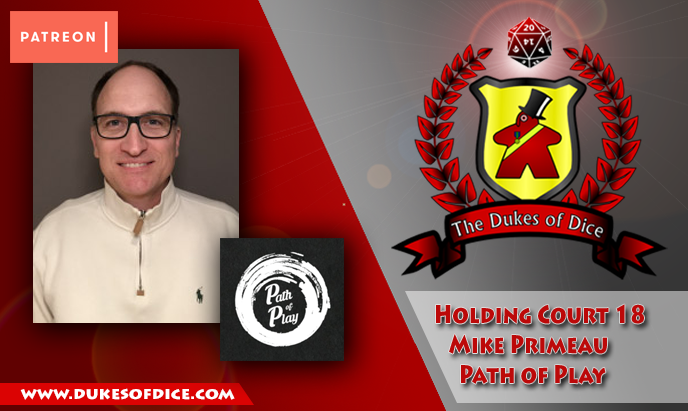 Discuss some big news for Alex and the podcast (1:21:33). 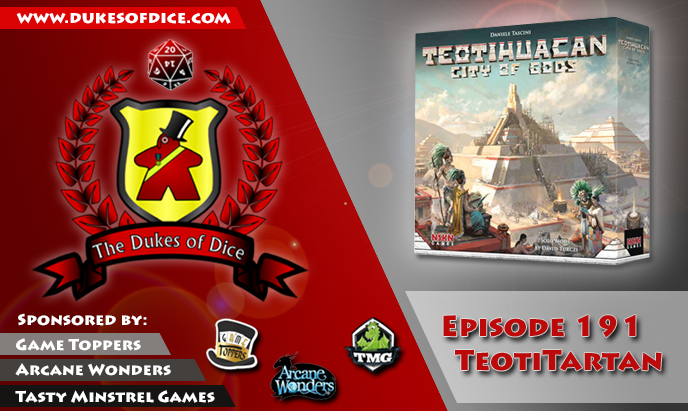 ... 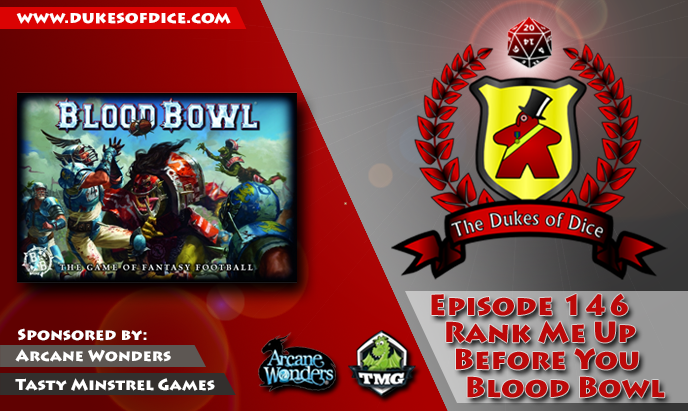 Discuss tie-breakers in games (1:01:01). 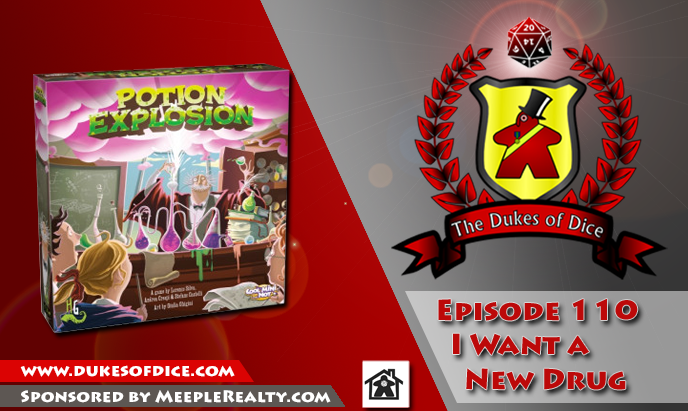 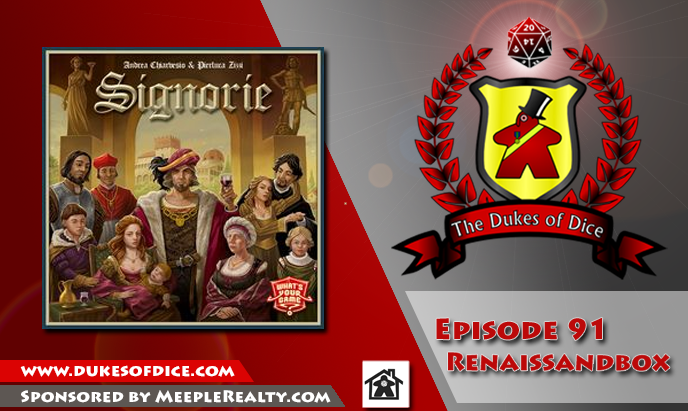 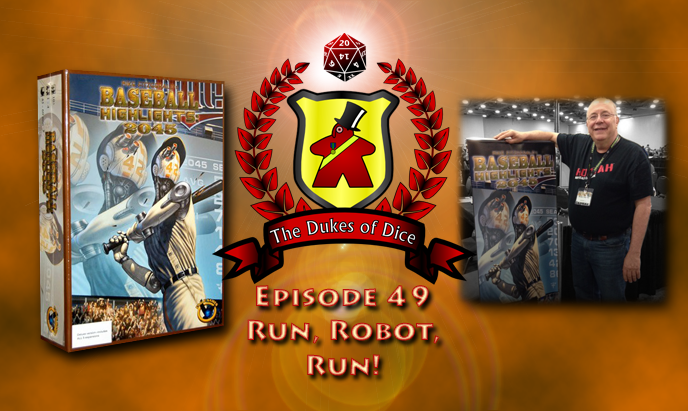 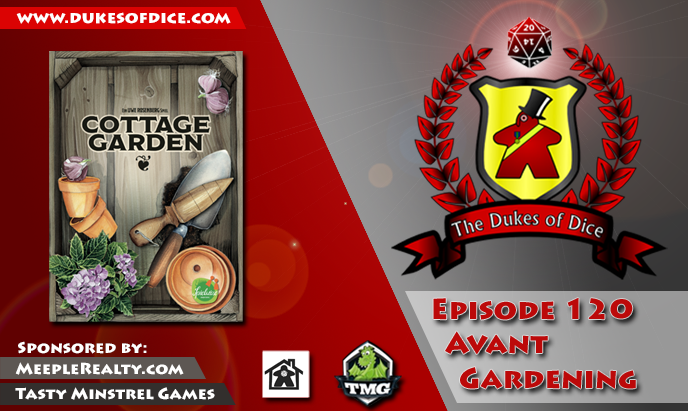 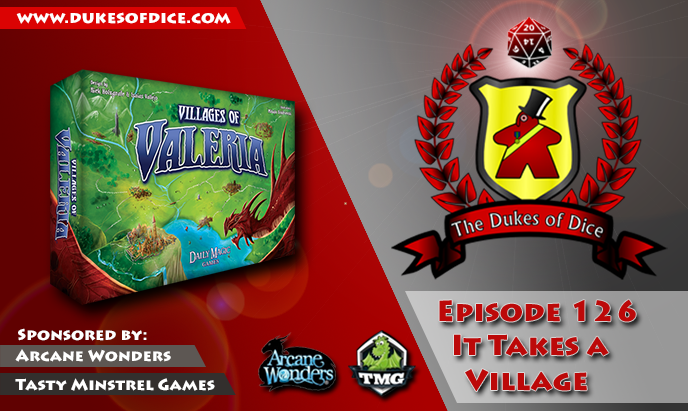 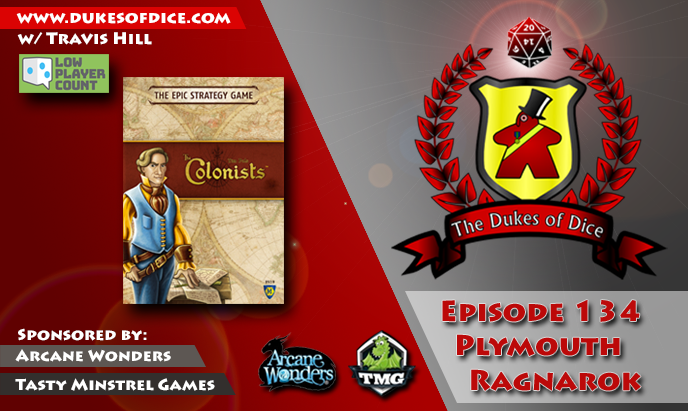 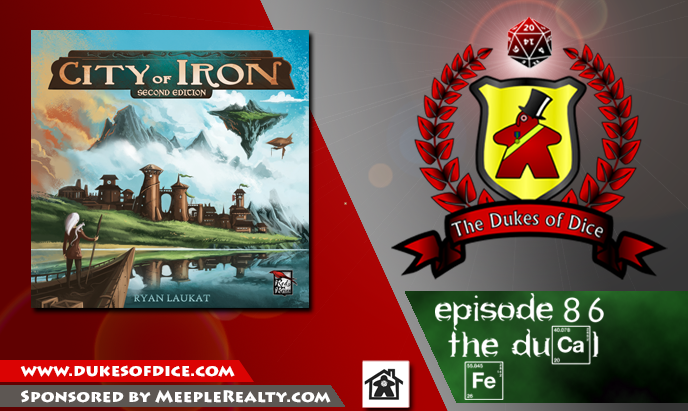 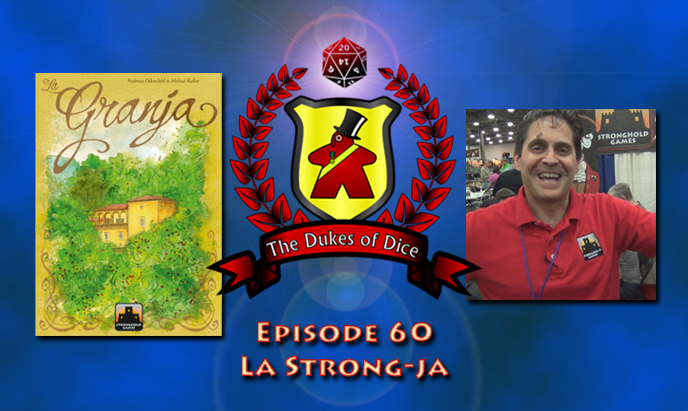 This episode, Alex sits down with Don Eskridge, the designer of Duchy favorites The Resistance and The Resistance: Avalon. 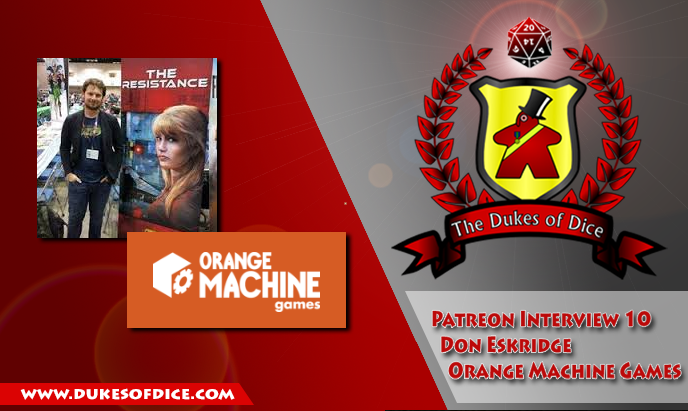 Don has a new game on Kickstarter from Orange Machine Games called Abandon Planet. 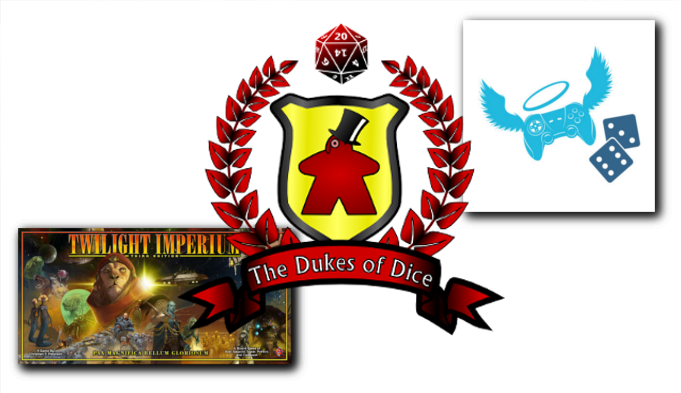 ... 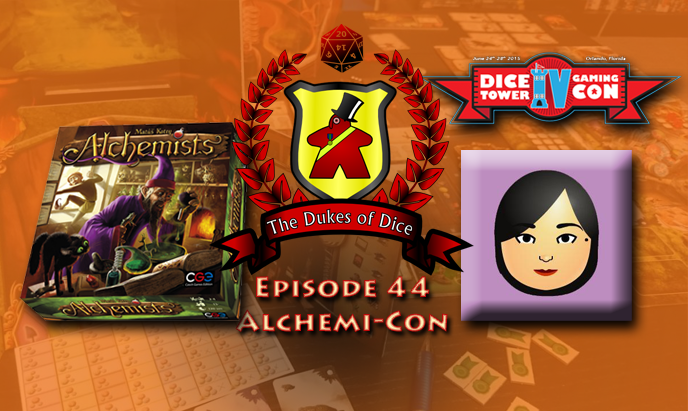 Discuss their board game crushes (1:11:38). 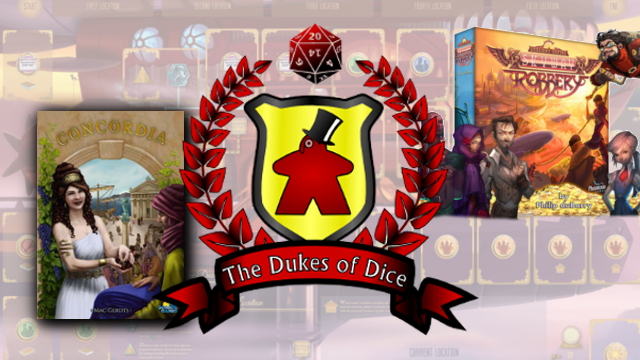 ... 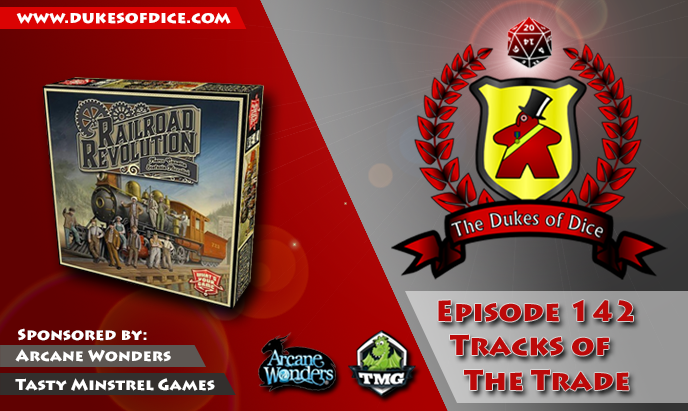 They check in every couple of hours to talk about the games they're playing including Arkwright, Heartthrob, Mechs vs. Minions, Ice Cool, Warmachine, Trick of the Rails, The Others: 7 Sins, Clank and more! 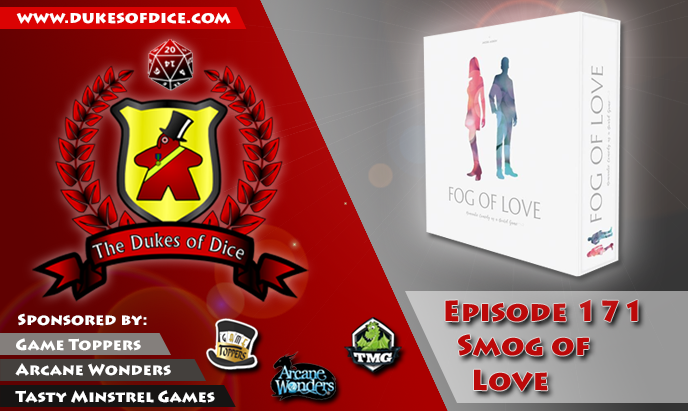 Sean is the Love Spreader of the Week over on BGG! 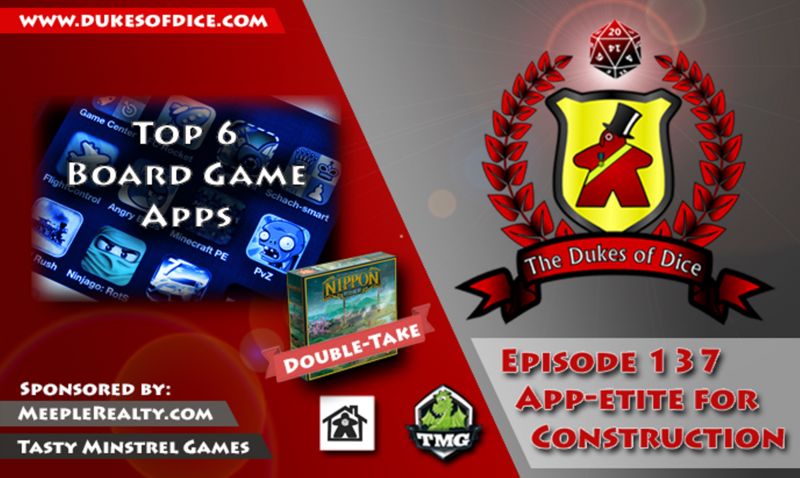 Check it out here! 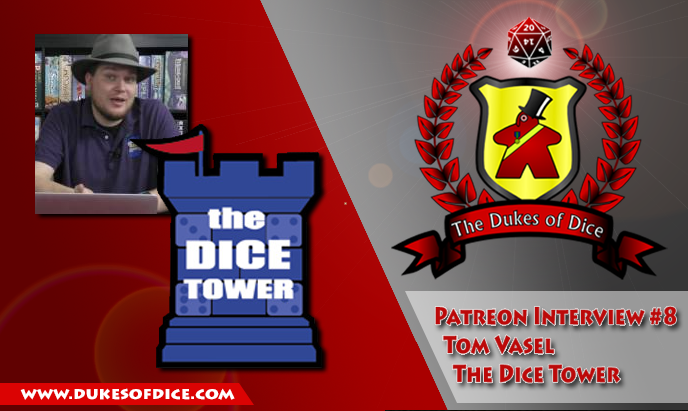 This episode, Alex sits down with Tom Vasel, from the Dice Tower. 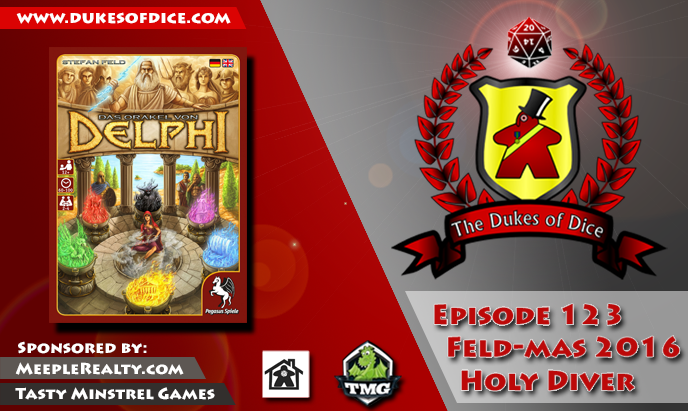 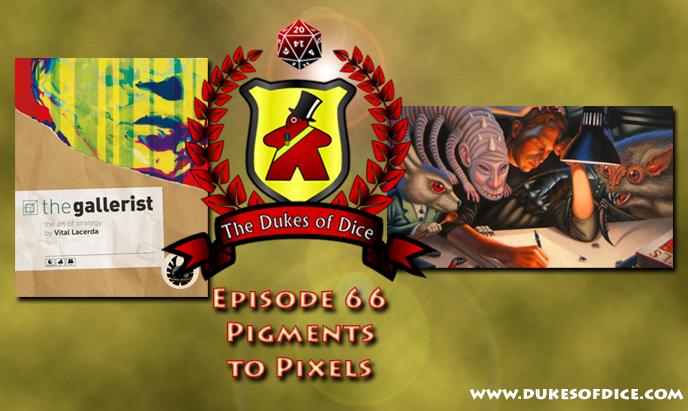 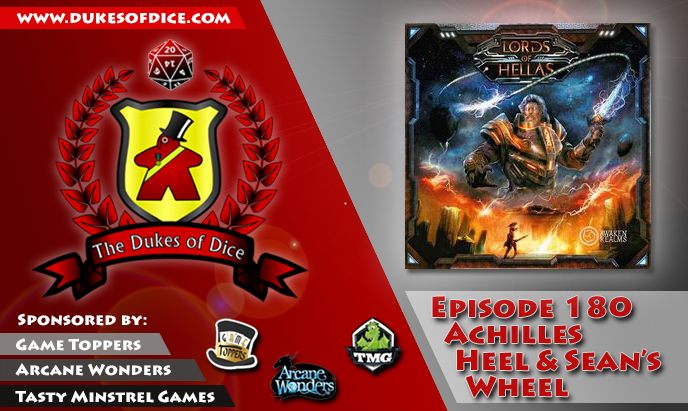 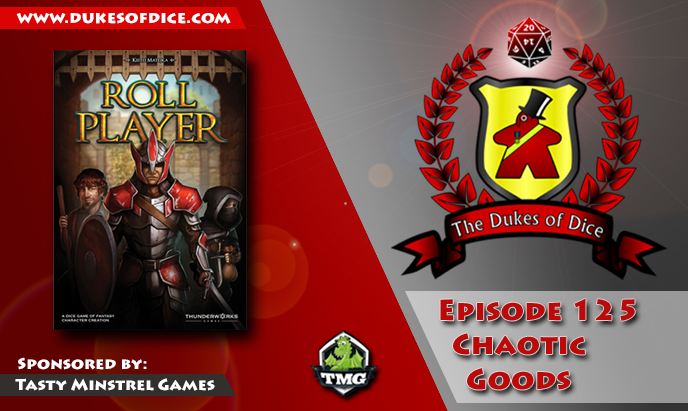 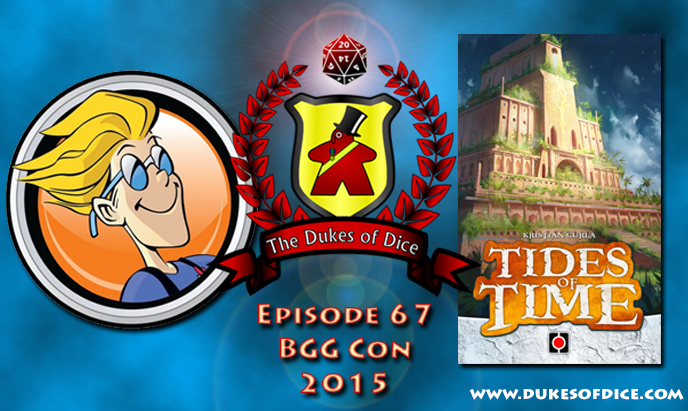 The two discuss reviewing board games, Dice Tower convention and tons more about the hobby. 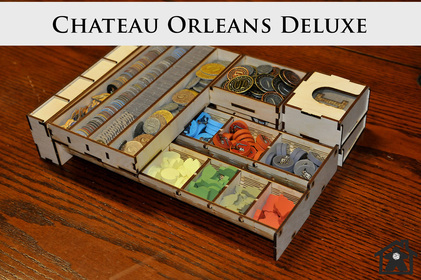 ... 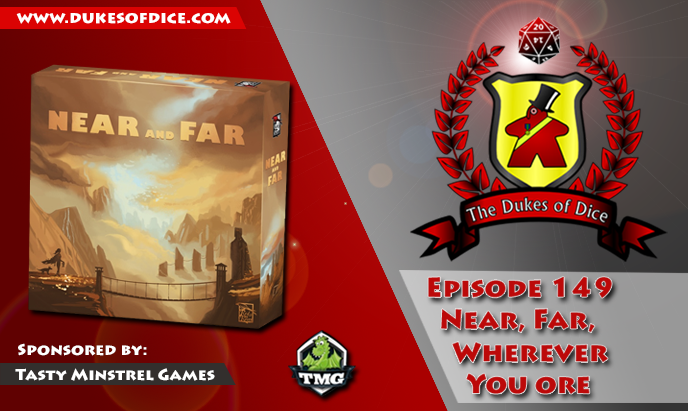 Discuss what board game settings they wouldn't mind visiting (1:11:58). 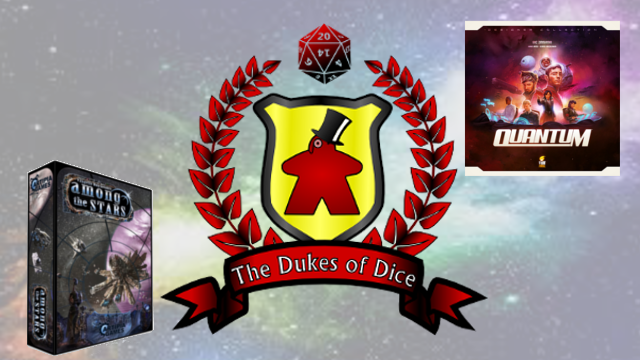 ... 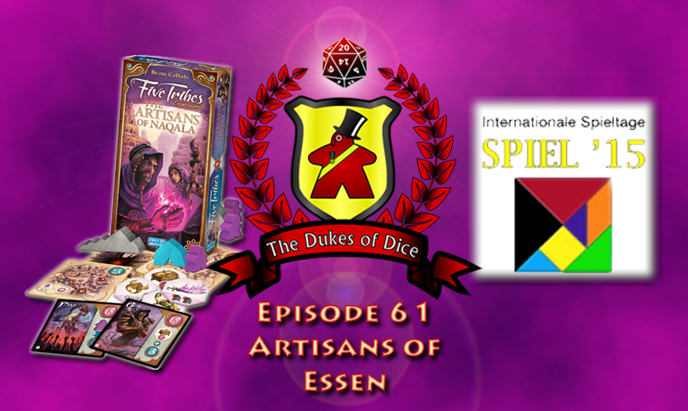 Discuss player colors in board games (59:38). 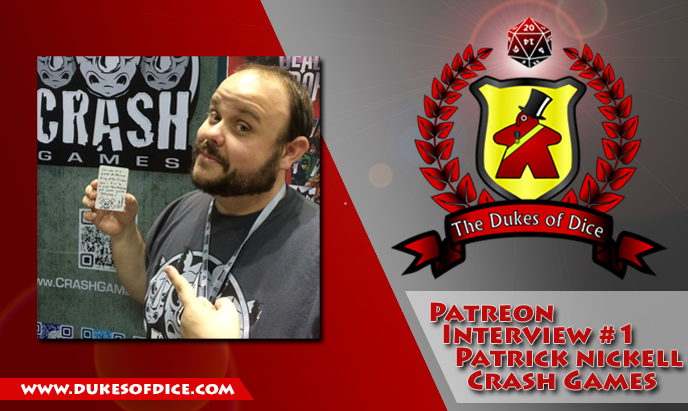 ... Answer some rapid-fire questions from the Ducal Mailbag (1:06:58). 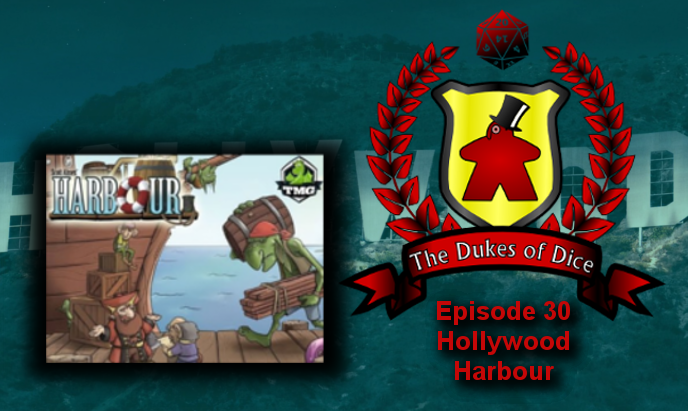 ... Look back at their review of Broom Service in their Dukes' Double-Take (55:58). 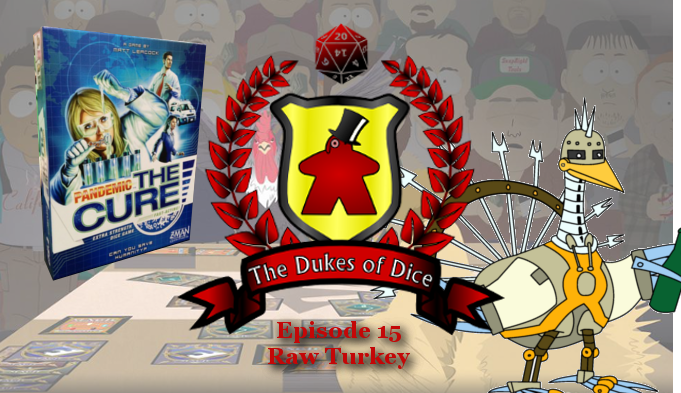 ... 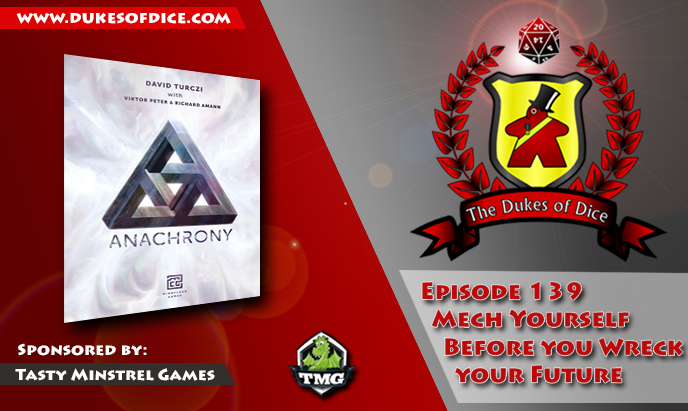 Discuss the State of the Duchy (1:10:46). 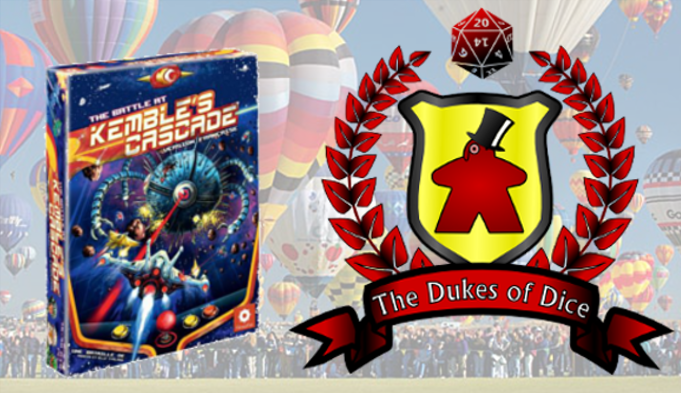 Click here to answer the Dukes' survey for a chance to win a $50 gift card to Coolstuffinc.com! 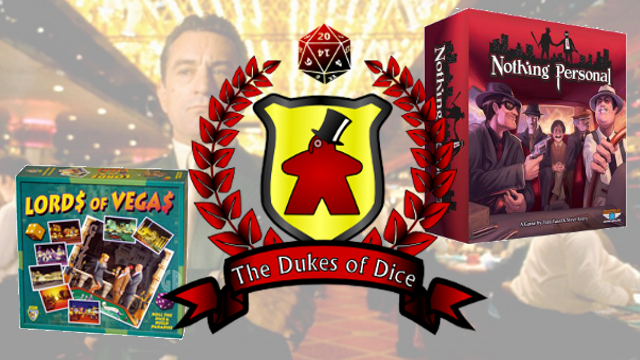 ... 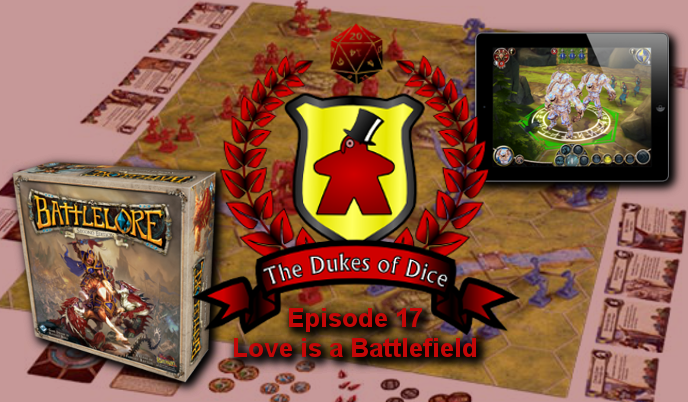 Discuss some of their love-hate relationships with games (1:28:45). 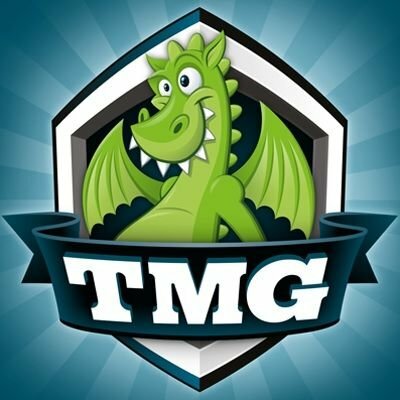 ... 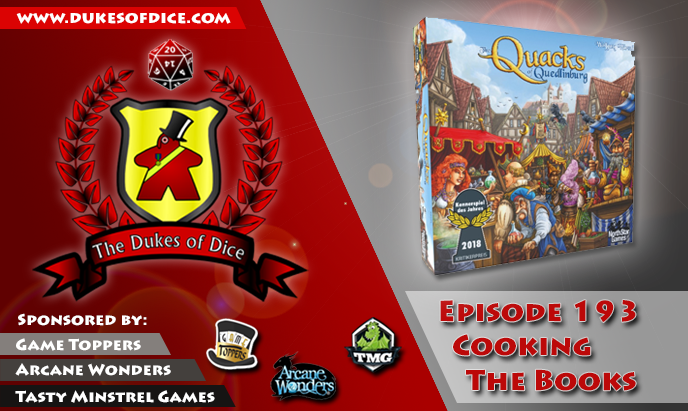 Discuss how to entice players to try heavy games (1:31:10). 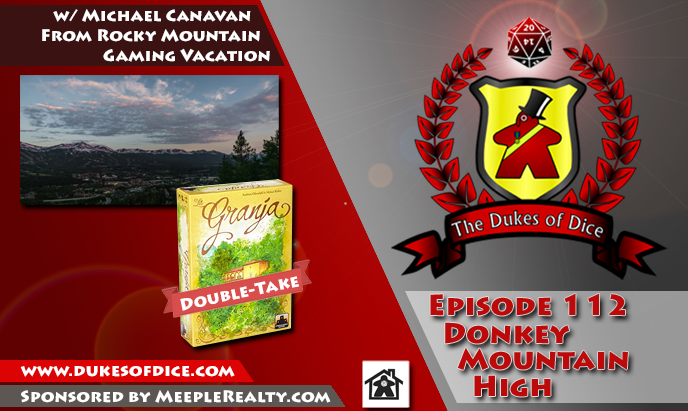 Deadline is Midnight Mountain time on August 8, 2016. 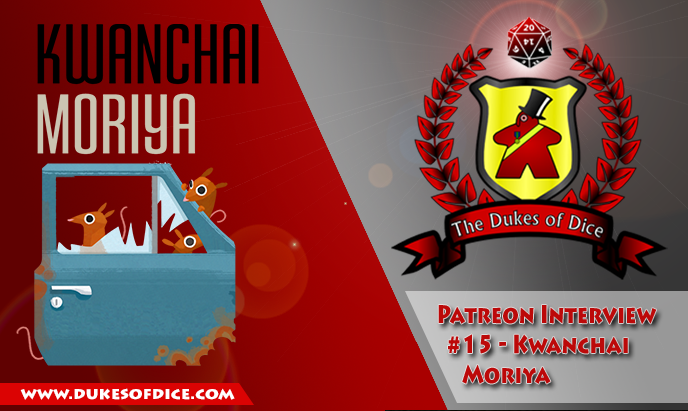 ... 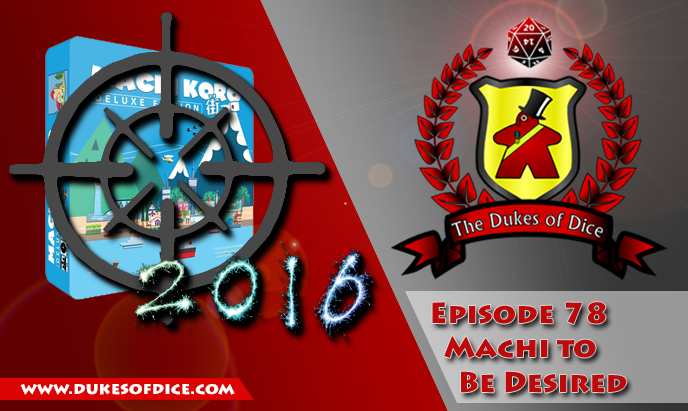 Provide a recap of the 2015 Dice Tower Award winners and their thoughts on the results (1:09:08). 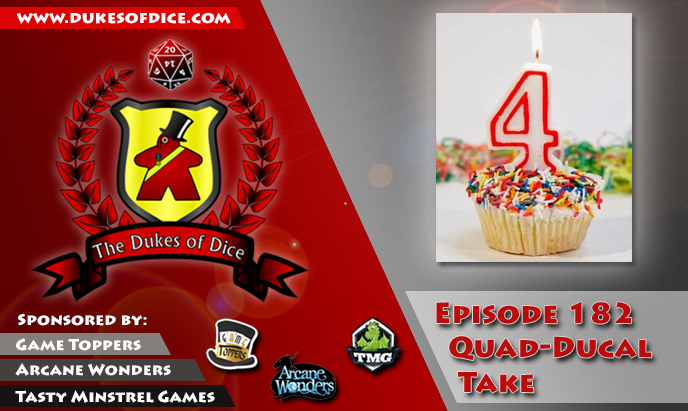 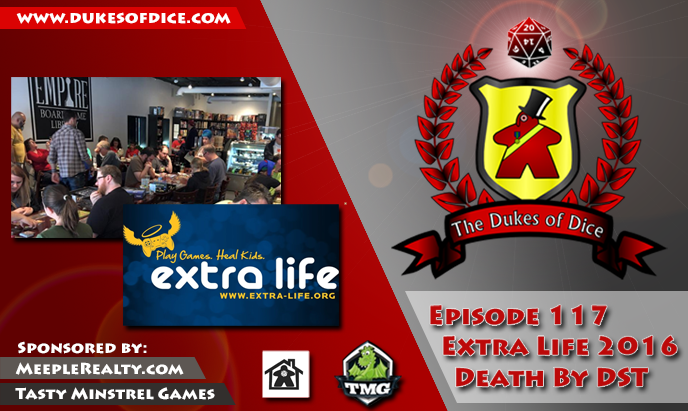 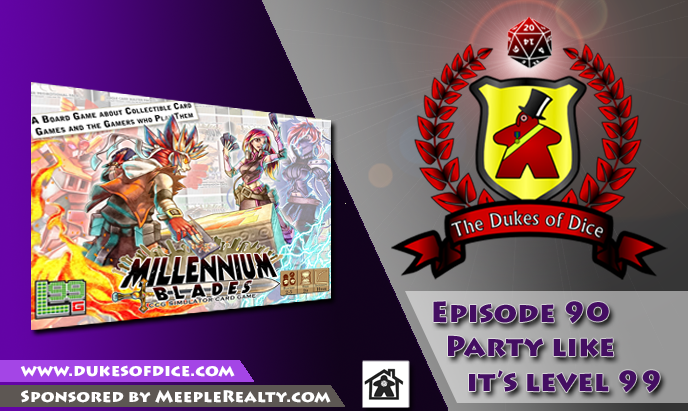 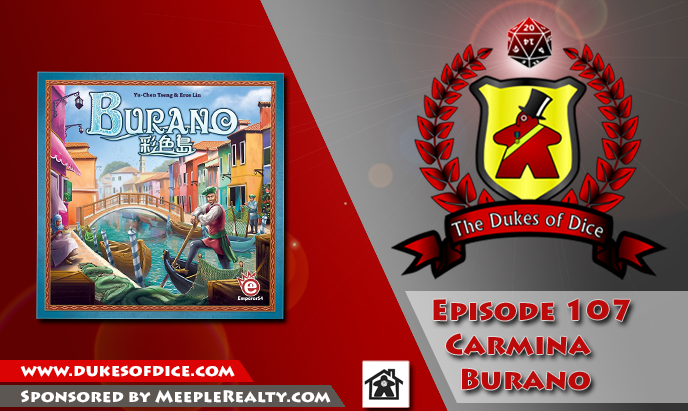 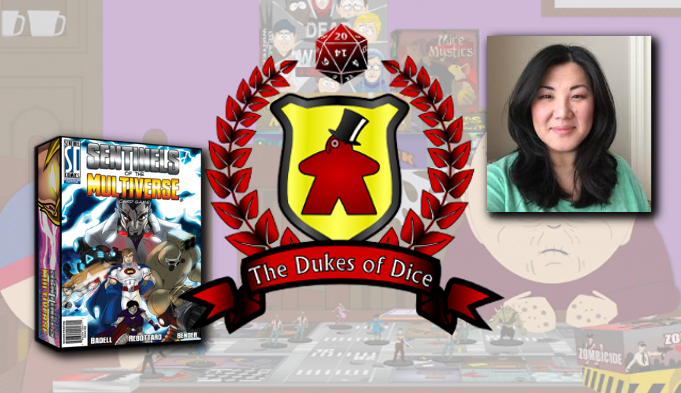 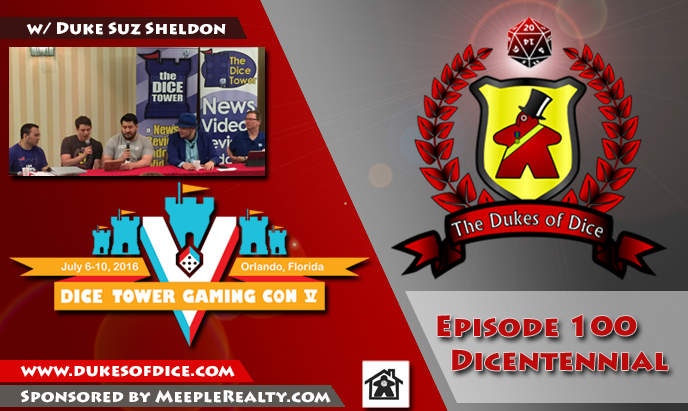 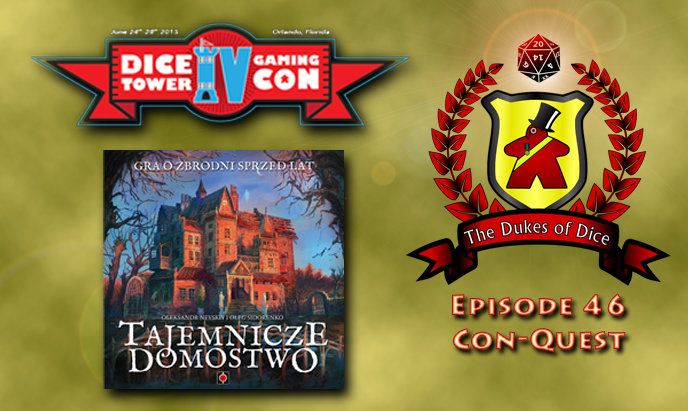 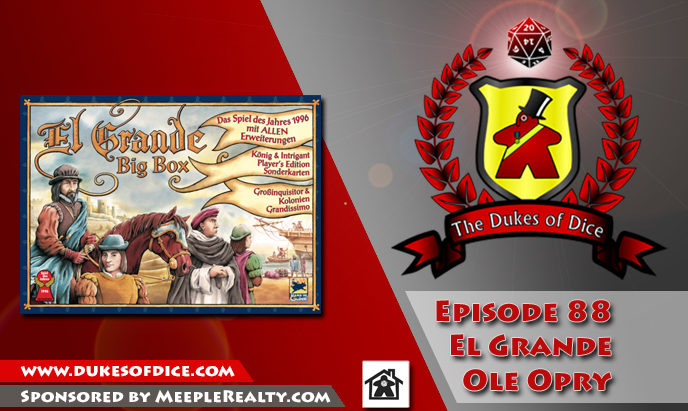 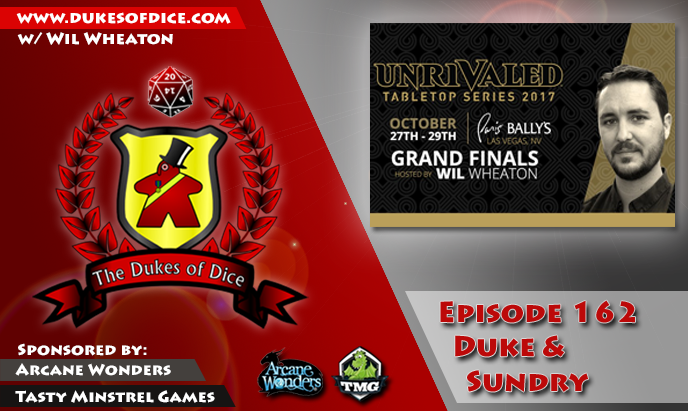 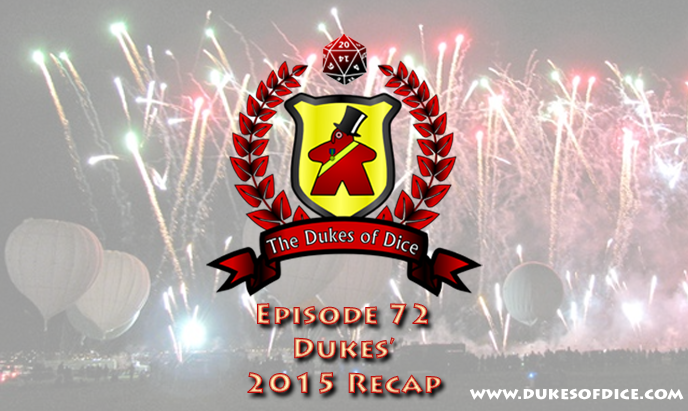 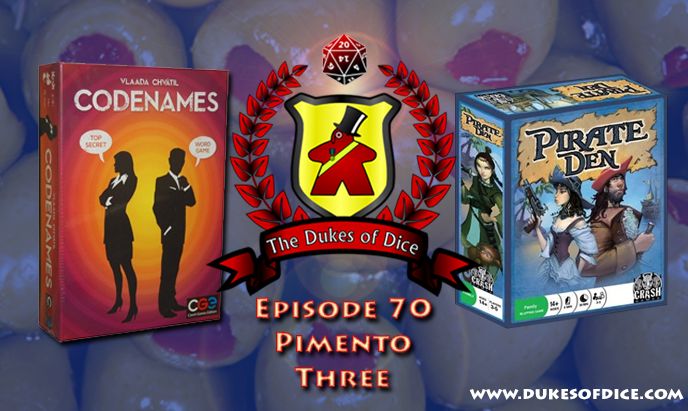 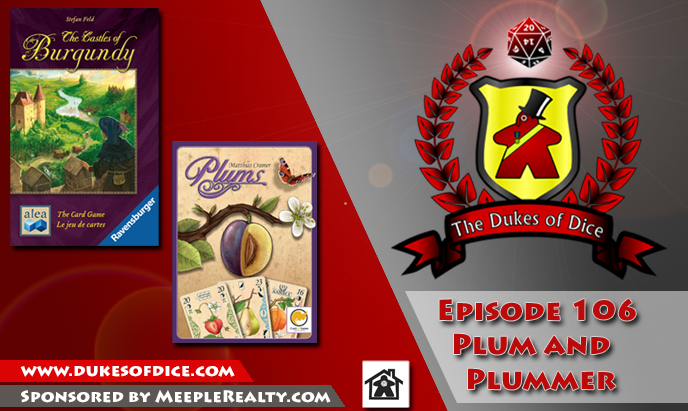 This episode the Dukes are in sunny Orlando at Dice Tower Con 2016 with Duke Suzanne Sheldon. 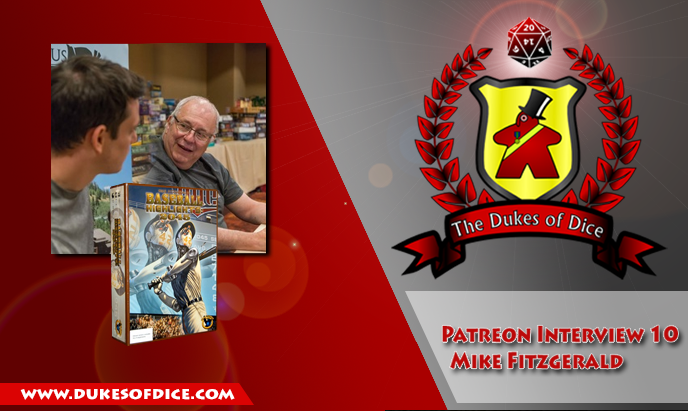 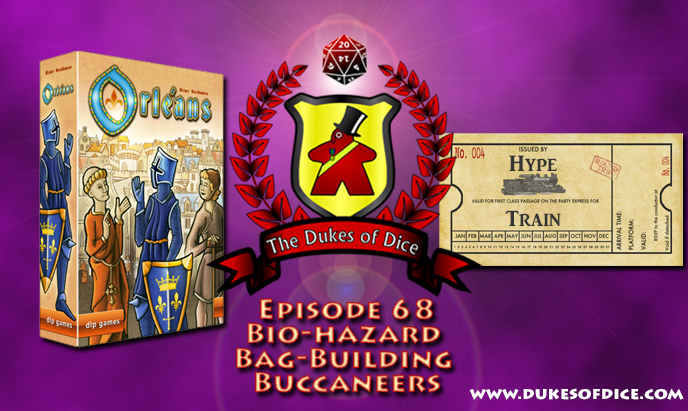 The Dukes report on their con experience including plays of a ton of games like Yokohama, Cry Havoc, Deep Sea Adventure, Celestia, Food Chain Magnate, Fish Frenzy, Imhotep, 879 Vikings, the Dragon & Flagon, Potion Explosion, Codenames: Pictures and Holmes: Sherlock and Mycroft. 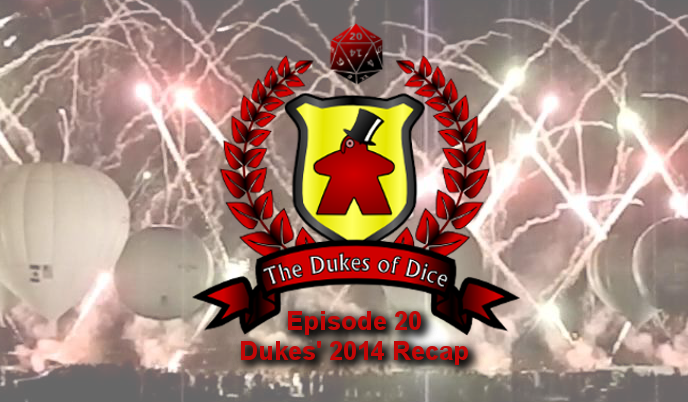 They also discuss some of the eventful highlights of the con! 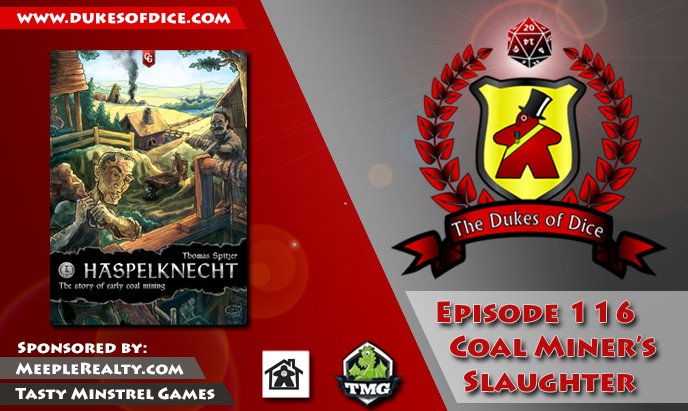 ... 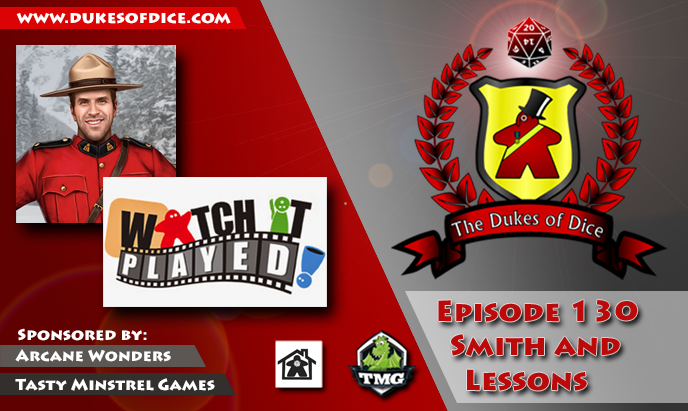 Discuss how recent TV/Movie viewings can affect what games they want to get to the table (1:33:59). 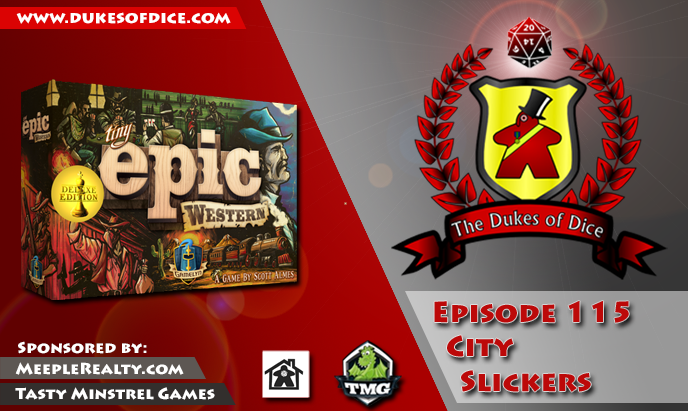 This episode, Alex sits down with Scott Almes, designer of the Tiny Epic Series. 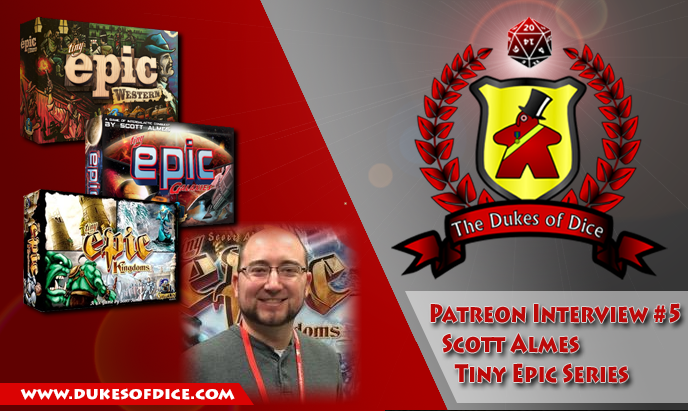 Scott discuss the future of the series, as well as additional game son the horizon! 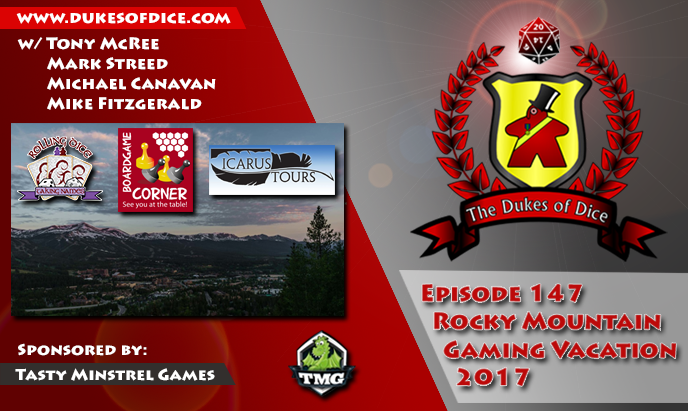 ... Alex recaps his trip to the Rocky Mountain Gaming Vacation (1:10:22). 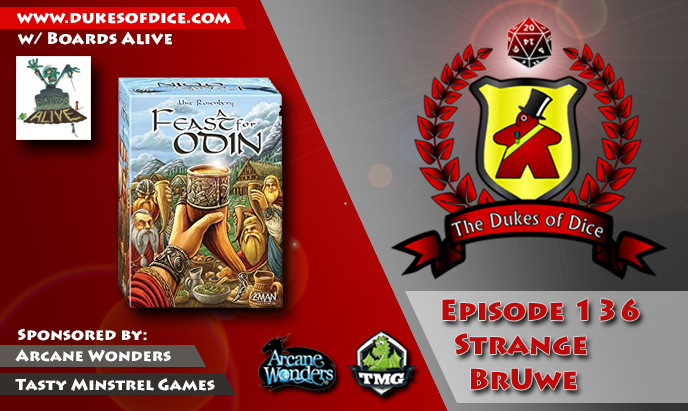 This episode, Sean sits down with Lance Myxter from Undead Viking Videos and Tasty Minstrel Games. 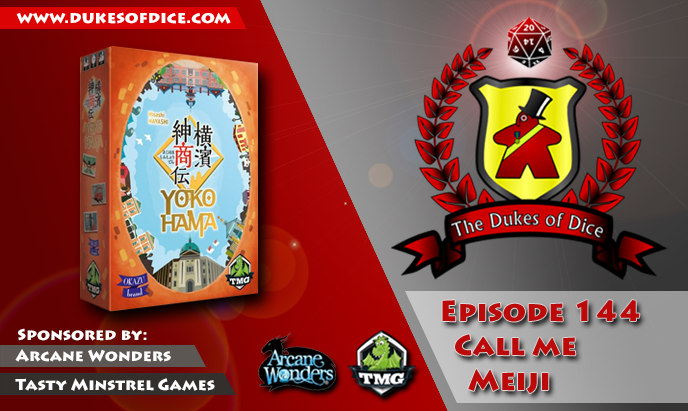 Check out Yokohama from TMG on Kickstarter on June 21, 2016! 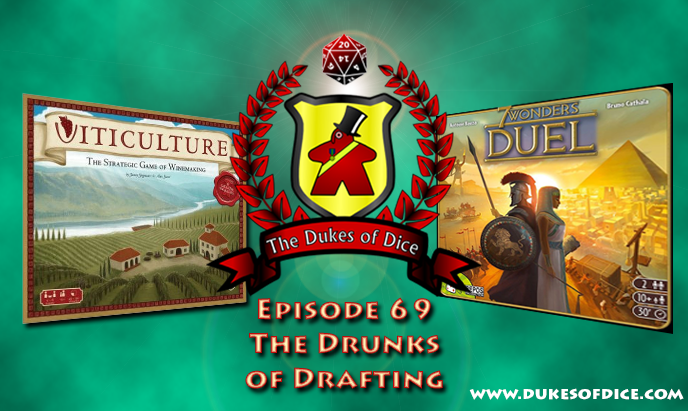 ... 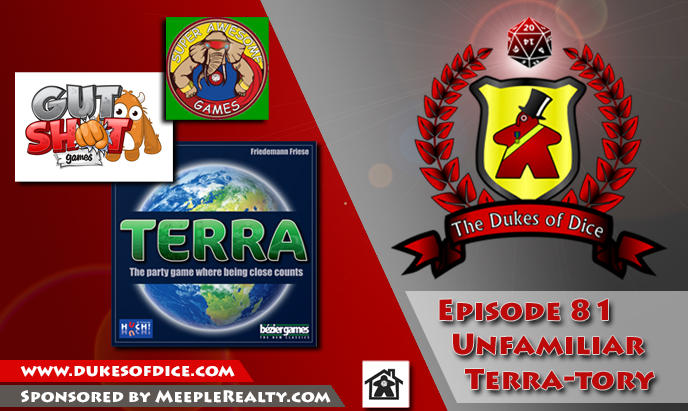 Discuss games that they like that their group doesn't (1:18:00). 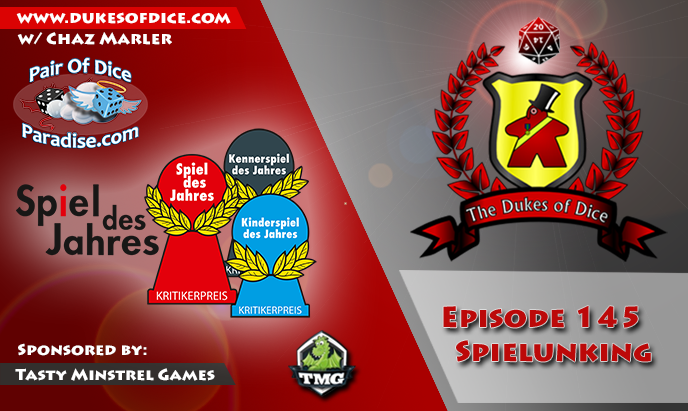 ... 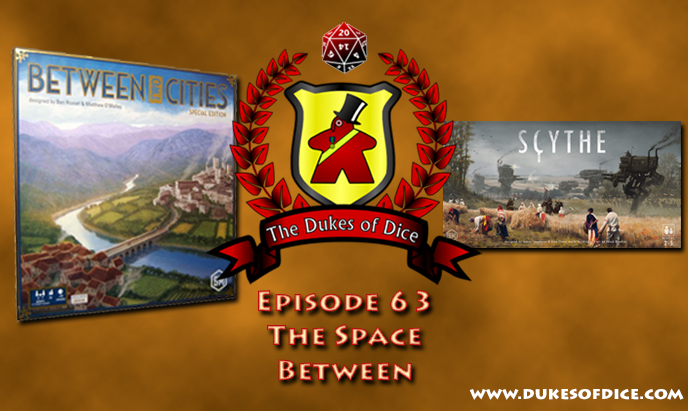 Discuss how to find a new game group when moving (59:30). 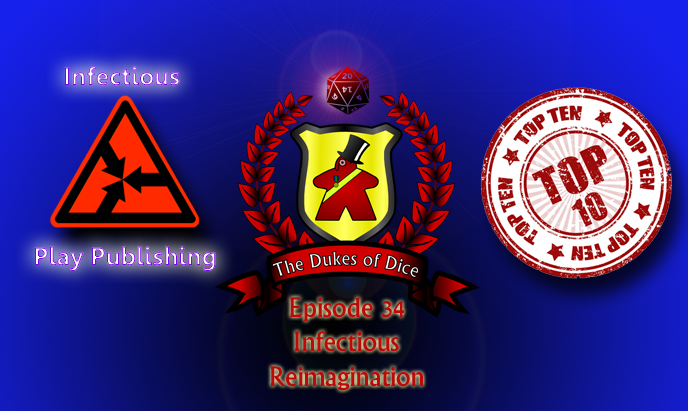 ... 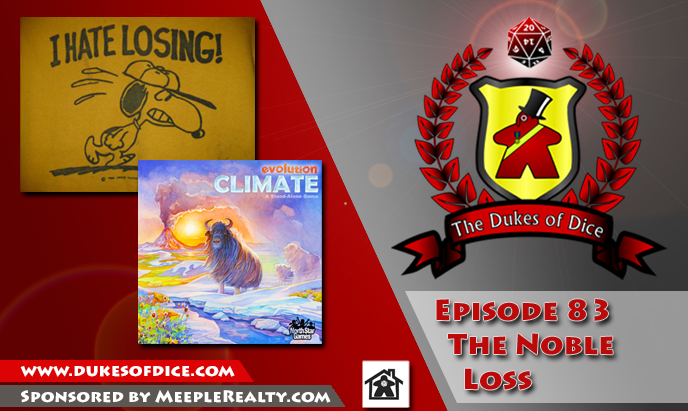 Preview Evolution: Climate now on Kickstarter (56:36). 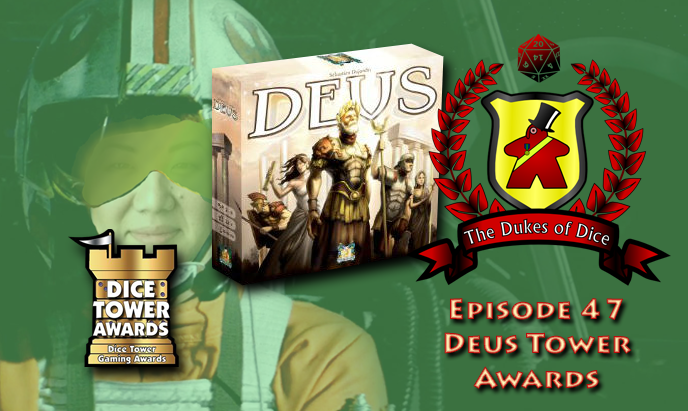 Please consider voting for the Dukes for the Best Podcast of the 2015 Golden Geeks Awards! 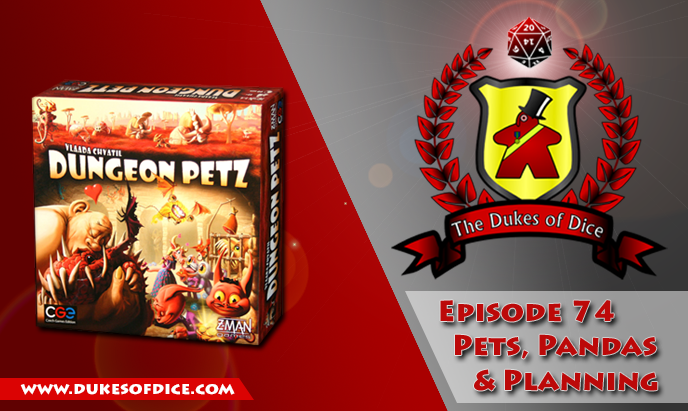 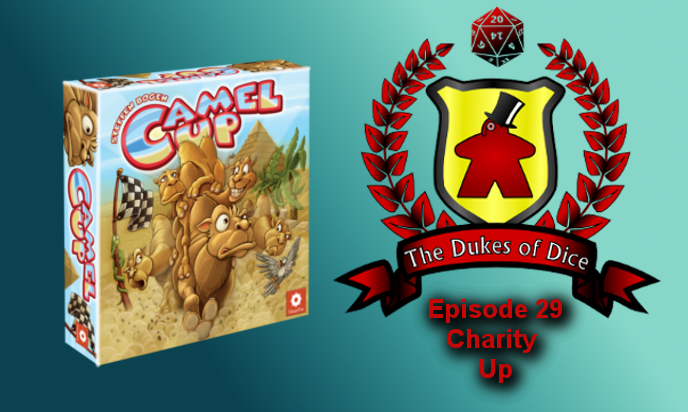 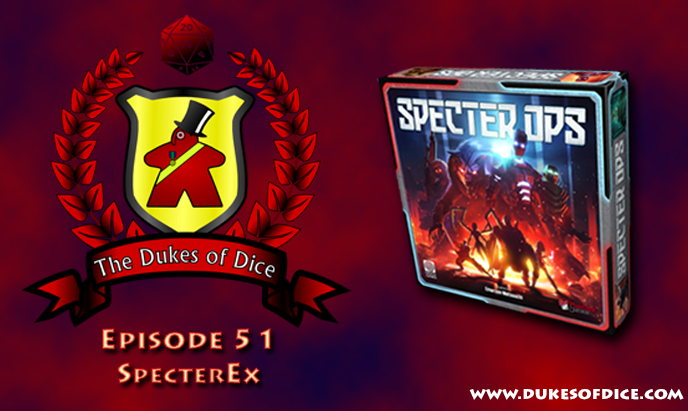 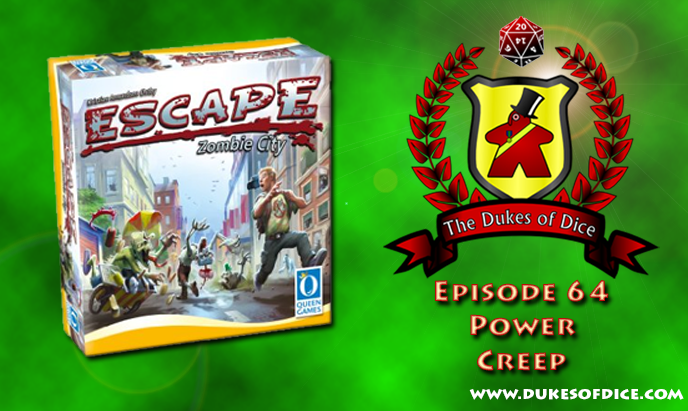 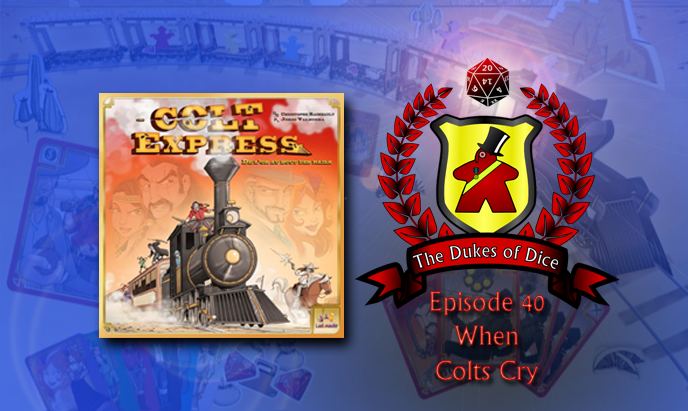 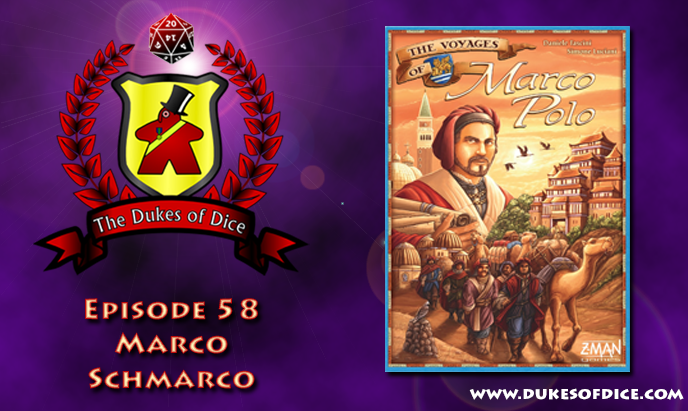 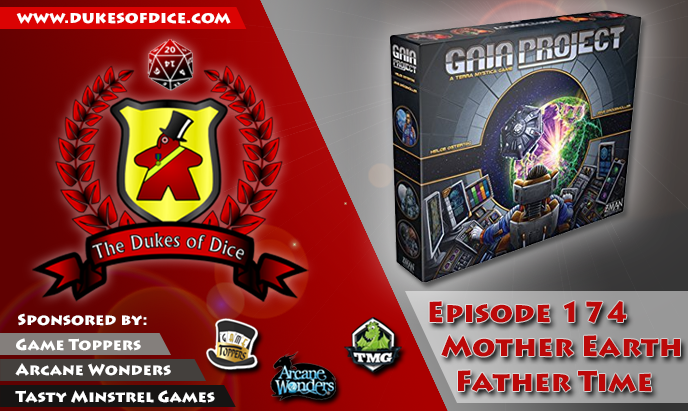 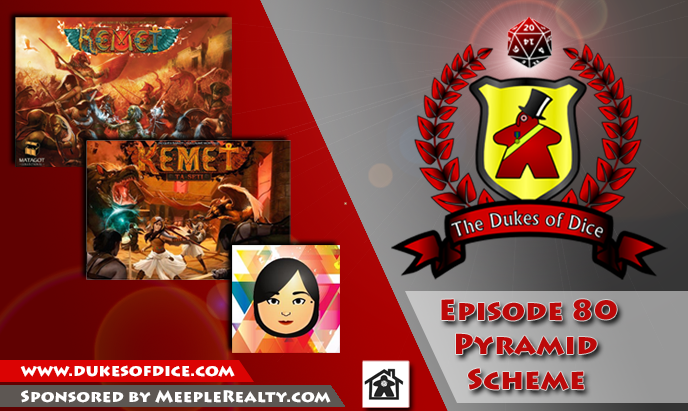 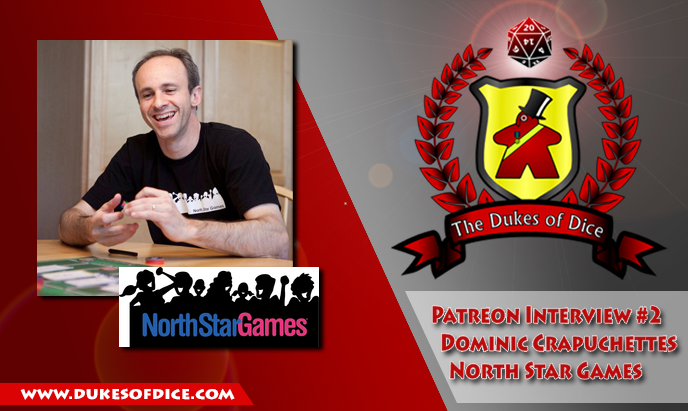 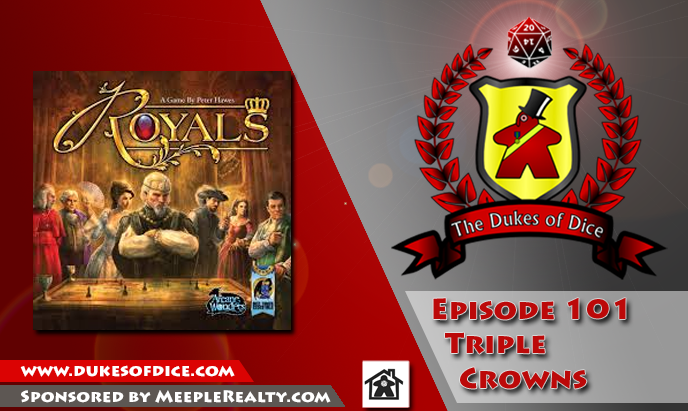 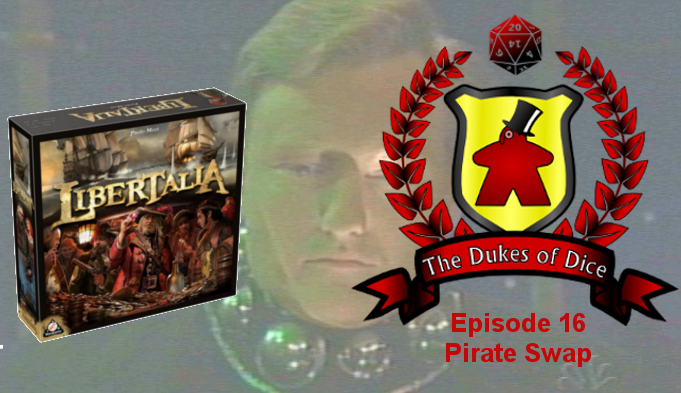 This episode, Alex & Sean sits down with Dominic Crapuchettes from North Star Games! 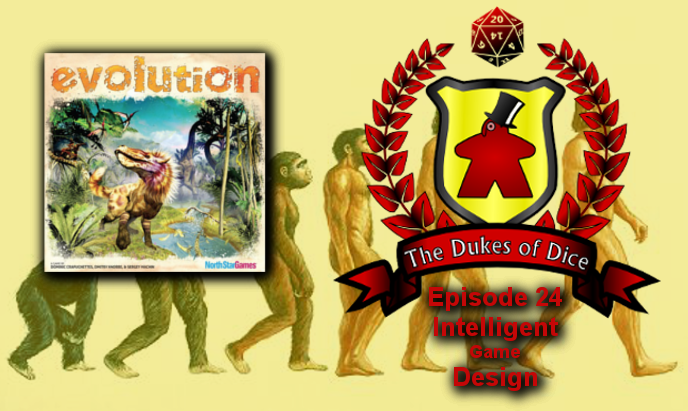 Check out Evolution Climate, now on Kickstarter! 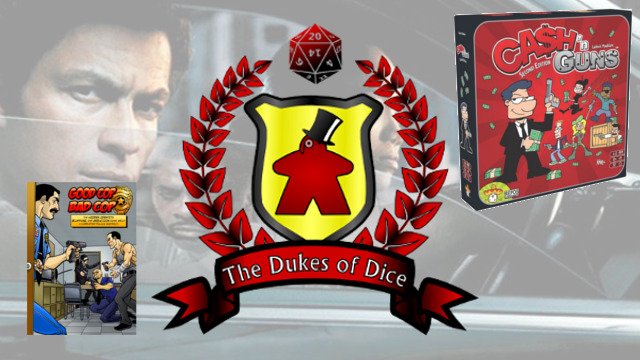 ... 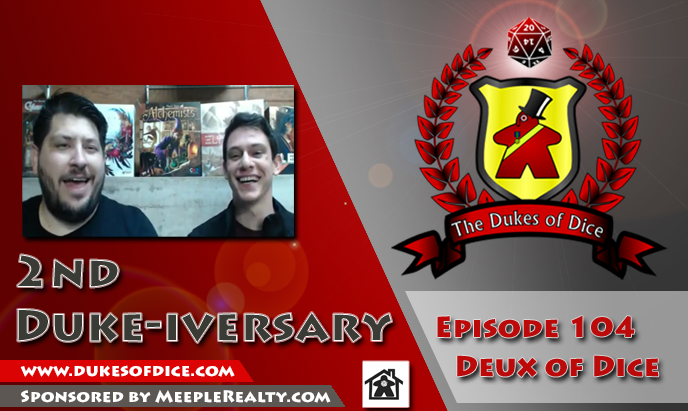 Discuss with Danny and Ben, their past designs including Legendary Encounters: Aliens, Vs. 2PCG and the World of Warcraft TCG. 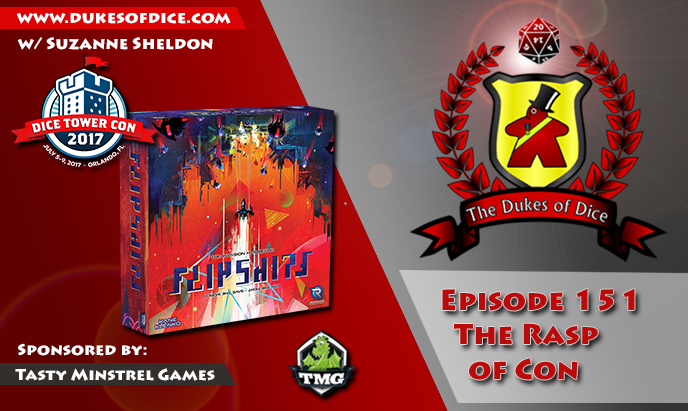 Plus they discuss their new game from Gut Shot Games, HEAD Hunters - a unique blend of toy, deck construction and tactical miniatures (58:04). 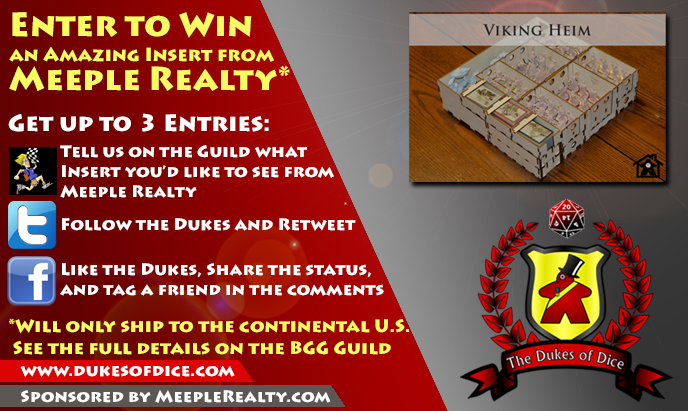 Meeple Realty is giving away one of their amazing inserts! 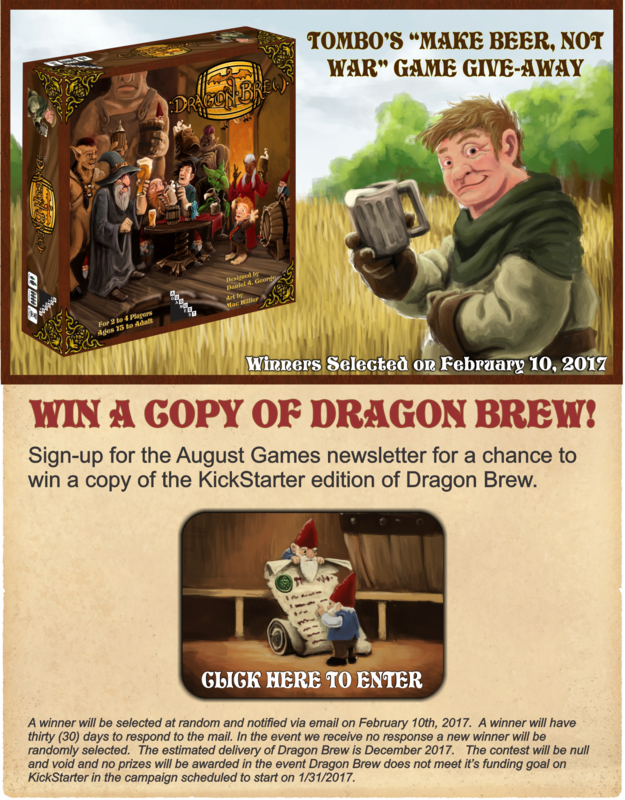 Check out the full contest details here! 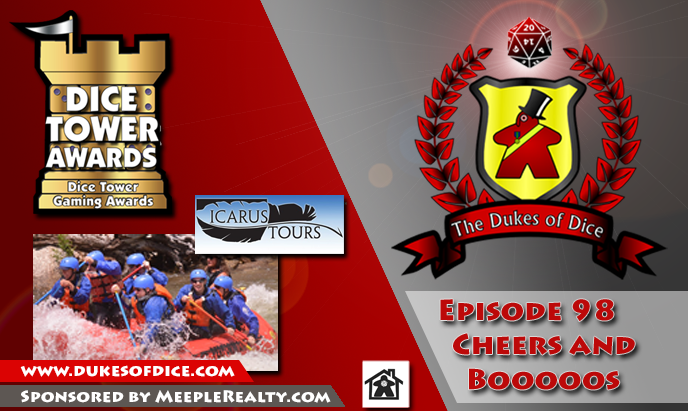 Please consider nominating the Dukes for Best Podcast for the Golden Geek Awards. 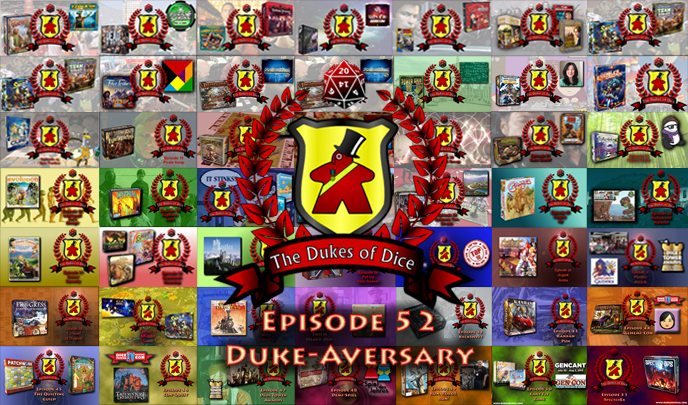 Click here to nominate the Dukes. 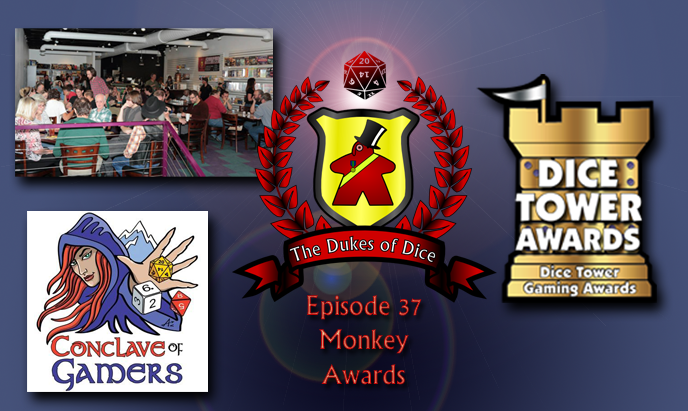 You can make your nominations here. 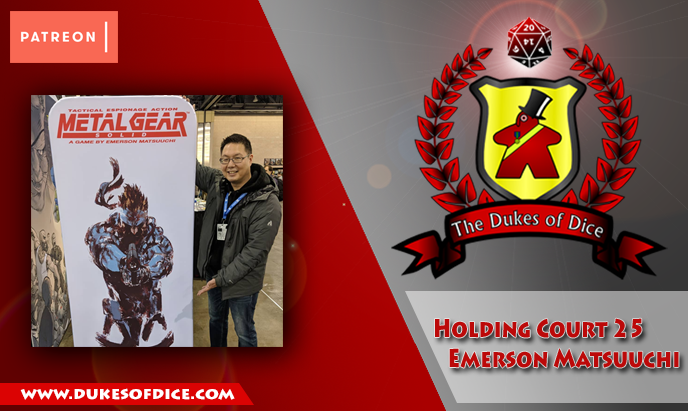 Deadline is 12am midnight CST March 4th 2016. 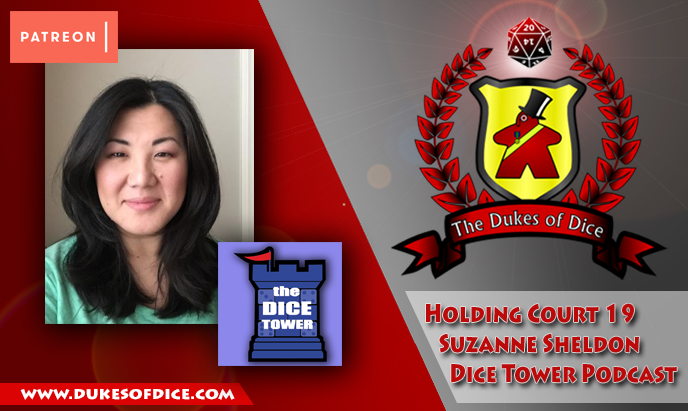 ... Suzanne answers some Guild questions (1:27:57). 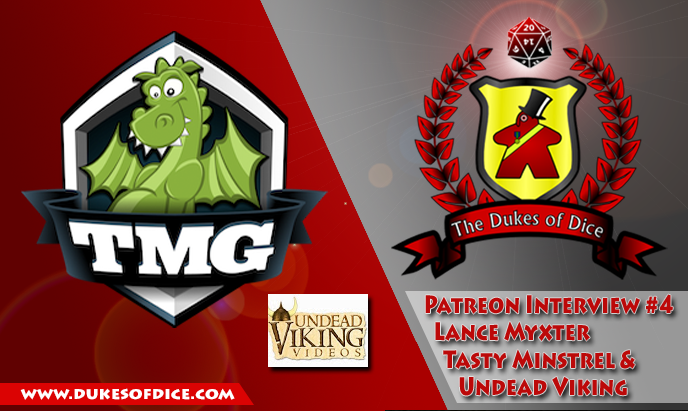 ... 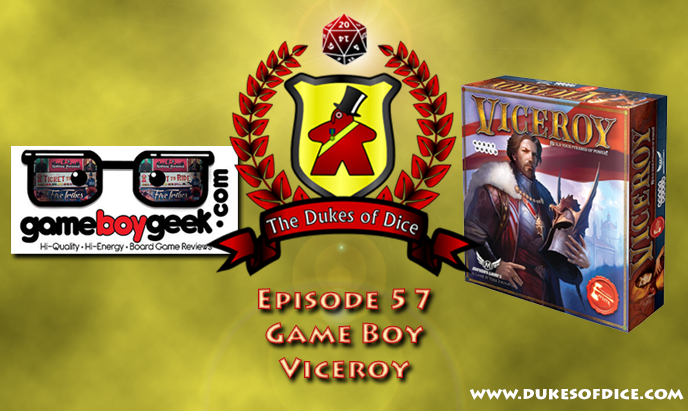 Discuss the big news for the Game Boy Geek and learn about his Kickstarter for Season 4 which is live today 2/15/16 (1:12:44). 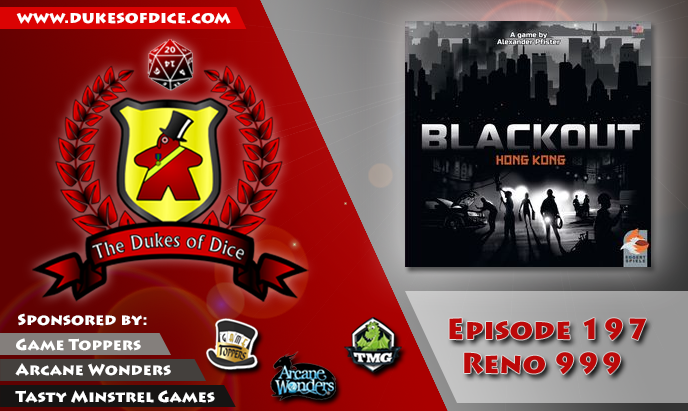 ... 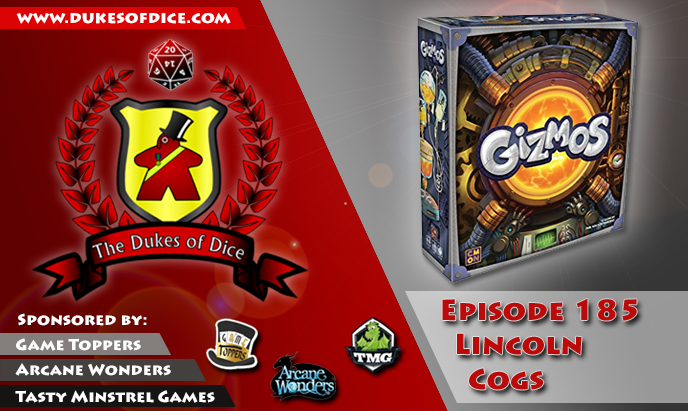 Discuss the translations of game shows to board games and vice versa (1:09:37). 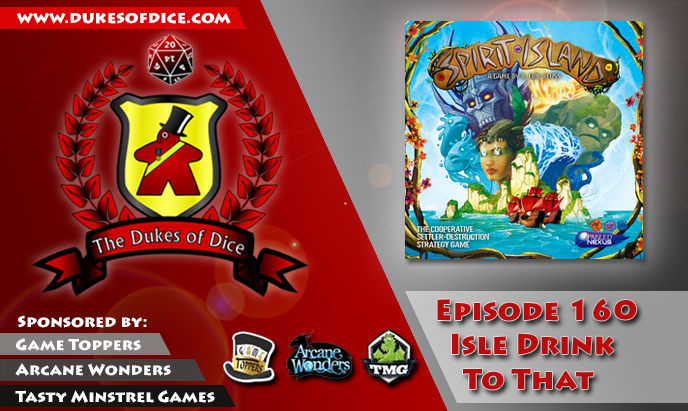 This episode, Sean sits down with Patrick Nickell from Crash Games! 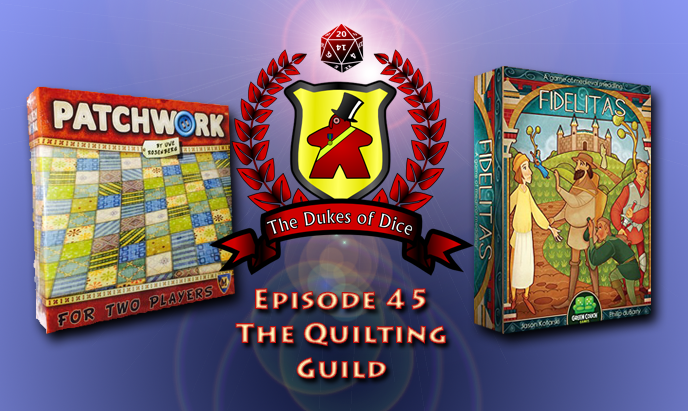 ... Answer the Guild's questions in their Dukes' Mailbag (1:01:55). 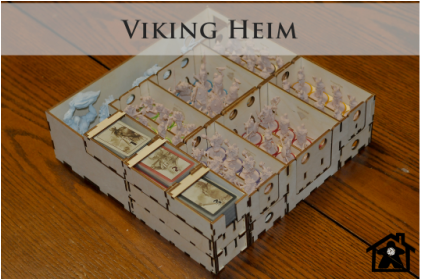 ... 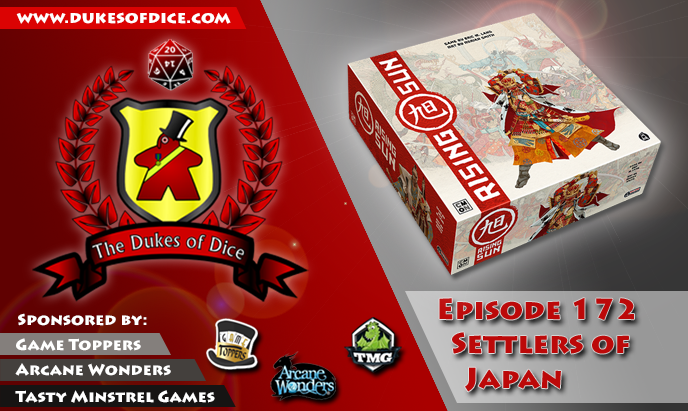 Discuss the new price restructuring from Asmodee North America (1:05:52). 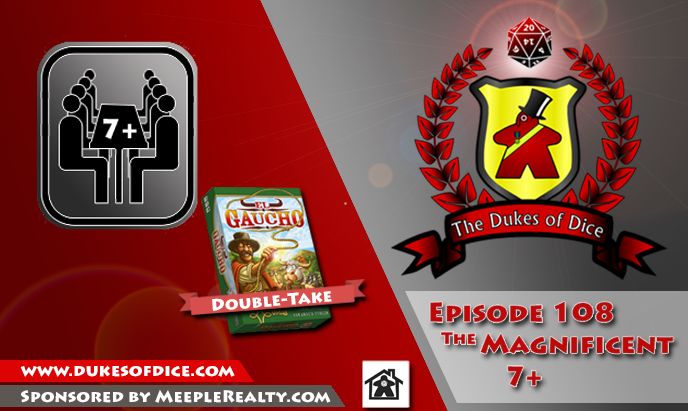 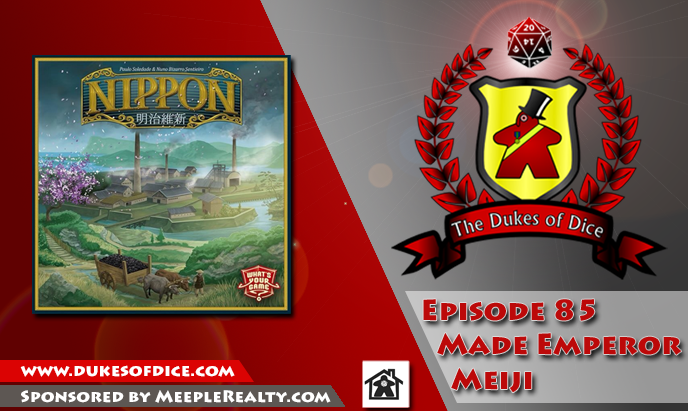 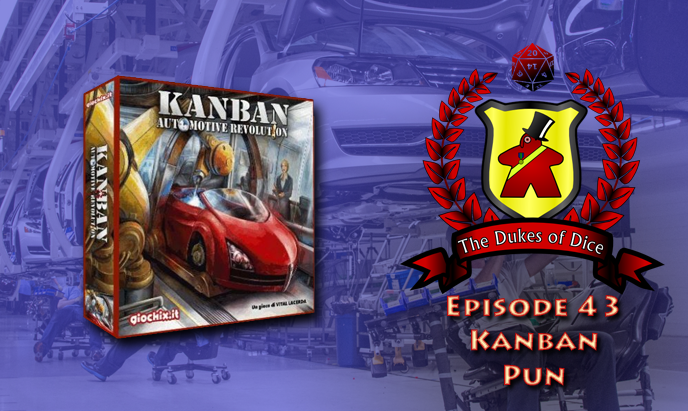 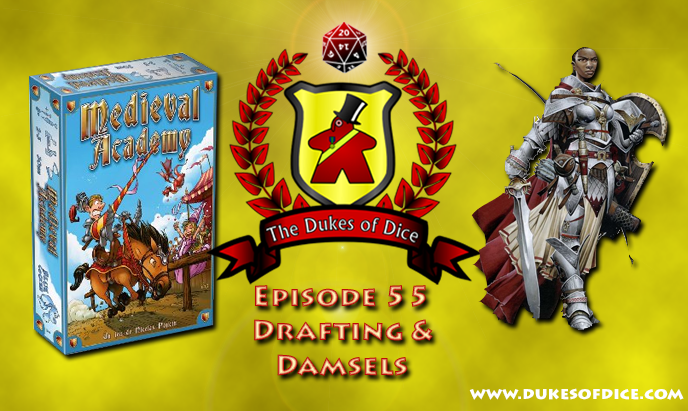 ... Look back at their review of Takenoko in their Dukes' Doubletake (51:35). 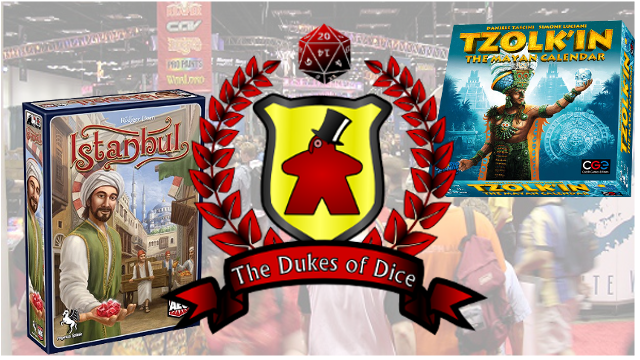 ... 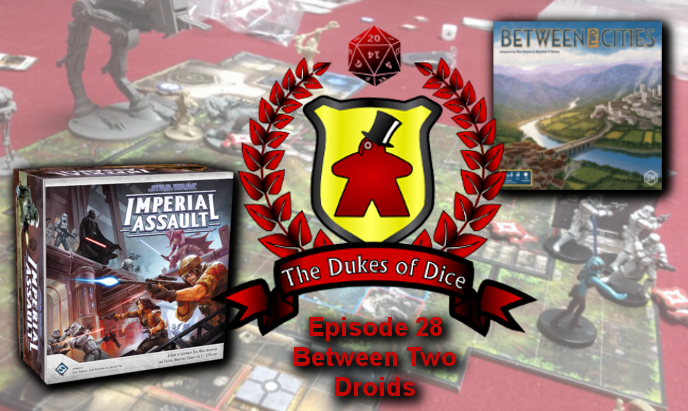 Discuss how relationships can affect board games. 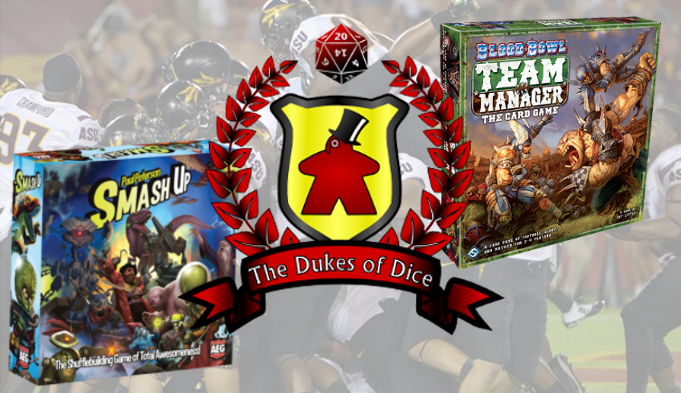 ... Sean's secrets to board game organization. 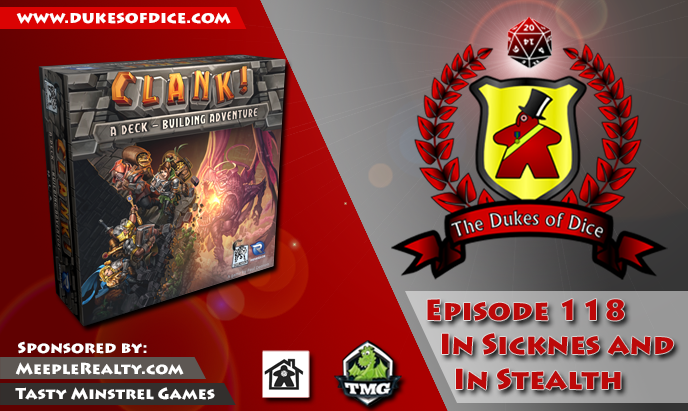 ...Put Puzzle Strike on trial.